The SV Geosounder returned to Geraldton, Western Australia on Thursday 20th of March 2008. 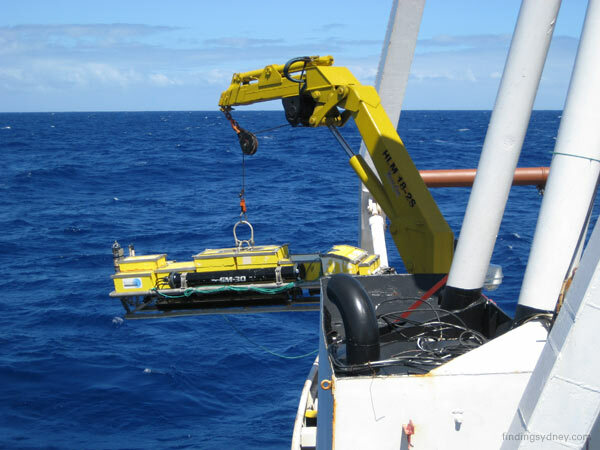 The demobilisation of the Williamson Sonar Spread has been completed and the mobilisation of an ROV team and specialist deepwater camera and lighting equipment, is currently underway. The SV Geosounder is expected to depart late Easter weekend where the Finding Sydney Foundation Search Diary Blog will recommence with further updates. The highly anticipated imagery of the HMAS Sydney II and HSK Kormoran from the ROV team is expected to be published at http://www.findingsydney.com, late next week. Knowing it was unlikely that such unique deeptow side-scan sonar equipment would ever again be available and mobilised on a vessel off the coast of WA, I had decided to collect the best possible sonar images of both wrecks before ending this phase of the project. 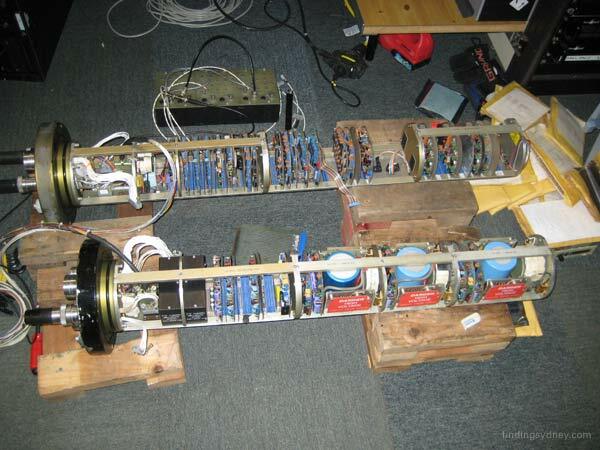 Our plan was to make two final sonar runs using the AMS60 on its highest-resolution setting. These would be the most challenging sonar runs attempted during the search because the swathe would be narrower than ever before and the chances of missing the wrecks would be considerable. 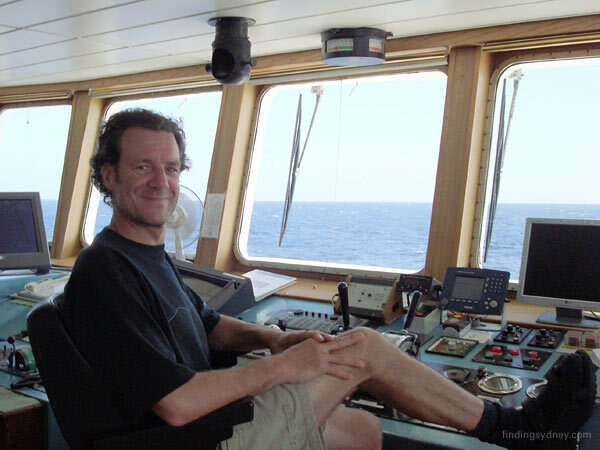 With the sonar towfish tracking as much as 3.8 kilometers behind the ship it would only have to be off-track by a fraction of one degree to miss the wreck completely. This is where the skill of the DOF surveyors and Mike Kelly would be paramount in determining the right trackline position. I would instruct them about the type of image I would like to see and the detail I was interested in - whether it was acoustic shadowing or dimensional detail - and leave the hard work to them. In this depth of water we used a method that has worked for me many times in the past, and that is to aim the sonar trackline straight at the target knowing full well that the sonar towfish would be off at least a small amount (100 metres or thereabouts) and this offset would place the wreck within the desired "sweet spot" of the sonar's primary beam to either port or starboard. This plan worked perfectly for our last pass on Kormoran's wreck, but we were all waiting anxiously watching the large 42-inch monitor in the main survey lab to see whether we would end the project on a high note of getting the image we wanted of Sydney's wreck or go home slightly disappointed. 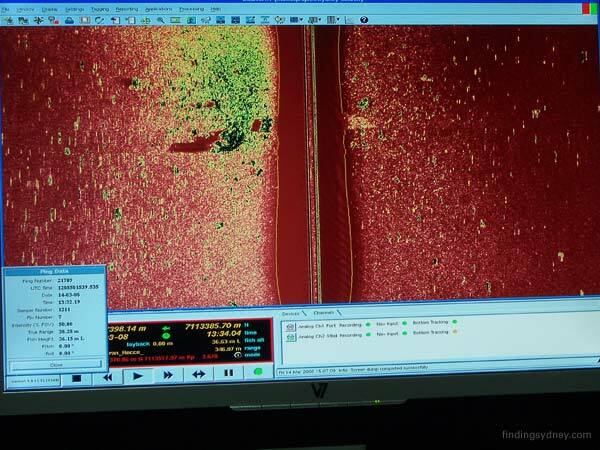 Well as you can see from the sonar image below we got exactly what we wanted - a near picture perfect sonar image that showed clear detail not seen in the previous high-res sonar images. For example the break at the bow, shown at the bottom right hand corner of the image, is now most evident with large pieces of structure lying adjacent to the bow. Also, there is a subtle pattern in the sediments just above the wreck which indicates where the hull first impacted the seabed and slid slightly downslope for about 50-100 metres before coming to rest. I suspect the natural slope of the seabed will have caused the hull to lean slightly over from upright, but these are details that will have to wait for the ROV video investigation for confirmation. Above Photograph: The final AMS60 high-resolution sonar image of the wreck of Sydney. The stern is at the upper left corner of the image and break at the bow is at the opposite corner, with the acoustic shadow off to the left of the hull. Above Photograph: Lieutenant John Perryman reads the order of service. 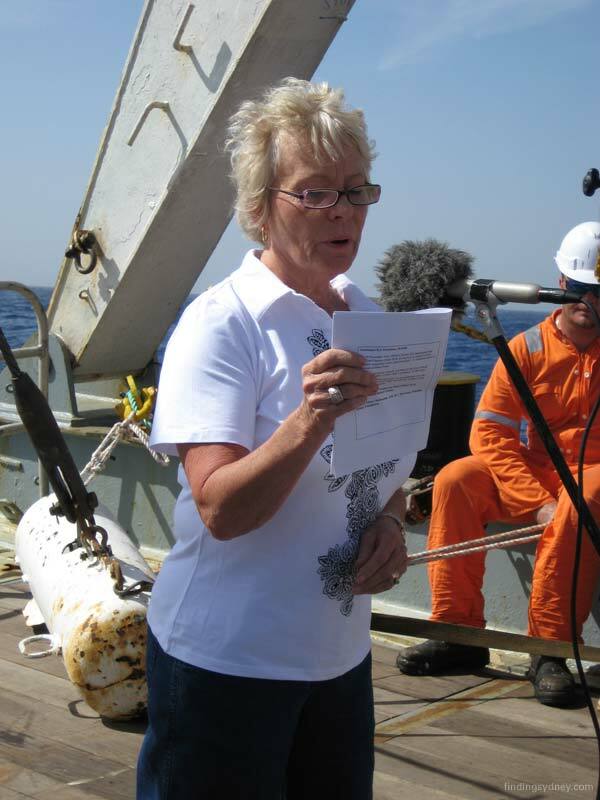 Above Photograph: Glenys McDonald reads A Sailor's Prayer. 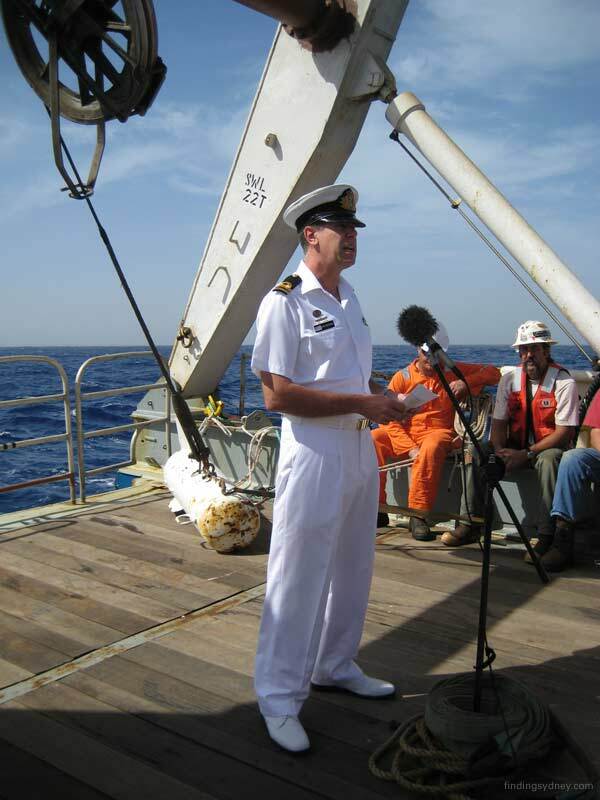 Above Photograph: Geosounder Master Blair Cliffe reads the Ode. Above Photograph: Lieutenant John Perryman lays the commemorative wreath. Above Photograph: The commemorative wreath drifts over the wreck of HMAS Sydney (II). 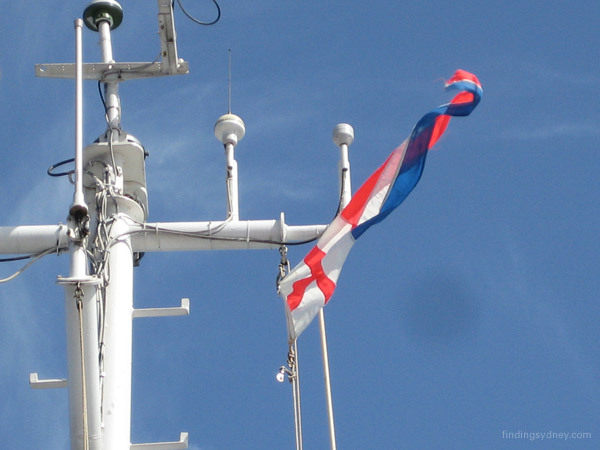 Above Photograph: The Church Pennant, symbolising that the crew is at prayer, flies from Geosounder's mast. Above Photograph: A Sailor's Prayer: The text to A Sailor's Prayer. I have to say that today was one I will treasure for eternity. As a Director of the Finding Sydney Foundation, and on behalf of my other directors – Chairman Ted Graham, Don Pridmore, Cdr Bob Trotter RANR, and Keith Rowe, I took part in a moving and simple, unofficial wreath laying service above HMAS Sydney. The service was led by Lieutenant John Perryman and I had the privilege of reading a poem written by one of the lost crew of HMAS Sydney, Petty Officer H. B Shipstone, which served as an epitaph. The ode was read by the Geosounder's Master, Blair Cliffe, a former officer of the RN. 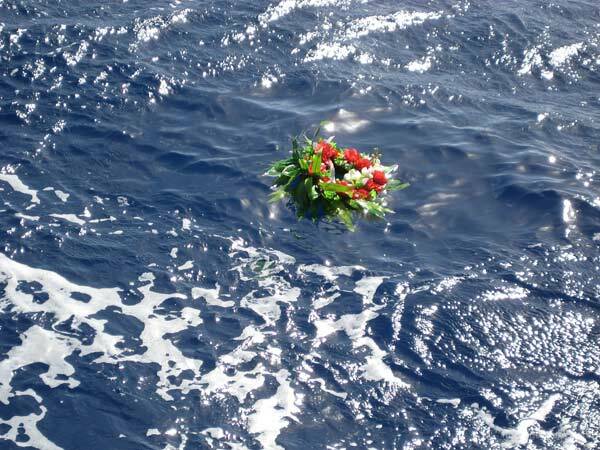 John cast the wreath on the waves and we watched it float away to the sad strains of the Last Post. Personally, standing on the heaving deck, I also realised that I was experiencing a private dream, to one day be able to say my prayers in this particular part of the ocean, a dream that has driven me on for the past sixteen years. I hope arrangements can be made to allow relatives this much needed privilege, although we are a hundred miles from the coast and the swell is anything but gentle. We are somewhat cocooned out here on the water but the emails streaming in from relatives show us that the Finding Sydney Foundation and David Mearns achieved what they set out to do, and I have been on an emotional roller coaster since Sunday. We have now commenced the long run to Geraldton and for the first time on this search David, John and I can relax. Today began as the clock passed midnight in the survey room as we commenced our approach on the Kormoran wreck site with the AMS60 side scan sonar. Before long we were beginning to see the first high resolution images of Kormoran. The thing which was most noticeable to me was the distinctive shadows she cast on the sea bed. David Mearns was extremely pleased with the image and we finished our sweep of the line at 00:35. After a long and exhilarating day we were both pleased to call it a day. Dawn on the 18th brought with it strong winds and a long Indian Ocean swell, it also brought news of an engineering defect that would affect our speed. 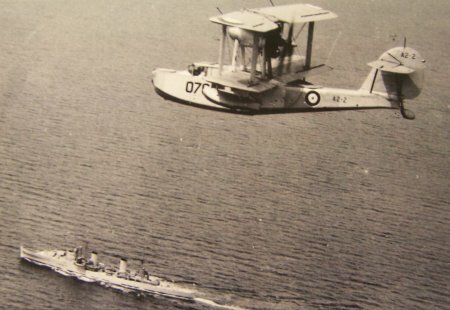 In light of this, a decision was made to make a single pass over the wreck of Sydney using the AMS60 before recovering it and conducting a short commemorative service over her resting place. This run was conducted at 12:23 when our final image of Sydney was collected during this phase of the operation. At 16:00, with our tow fish recovered, the crew and search team assembled on the quarterdeck of the Geosounder where I was privileged to lead a service to commemorate the men who lost their lives in Sydney. With our vessel over the site of Sydney’s wreck, the naval Church Pennant was hoisted on the starboard yardarm as a visual symbol of the solemnity of the occasion – our crew was at prayer. The order of service involved a brief introduction by me followed by the reading of a poem entitled A Sailor’s Prayer by Finding Sydney Foundation director, Glenys McDonald. I had especially chosen this poem for the occasion as it was written by a former Sydney crewman, Petty Officer H.B. Shipstone, who now lies with his shipmates in the silent tomb which is Sydney. This was followed by the recital of The Ode read by the Geosounder’s Master, Blair Cliffe, a former Royal Navy officer. This was fitting, as many Royal Navy personnel were serving in Sydney when she was sunk. The service concluded with the laying of a wreath by me, the playing of the Last Post followed by one minute’s silence, the Rouse and Australian National Anthem. With the service complete, we took time to reflect before shaping our course for Geraldton. IMPORTANT NOTICE: The Material (including photographs) available in the "Press Room" section of this Website may be used/reproduced unaltered by your organisation (unless stated otherwise within the content description) subject to the terms and conditions set out in the Legal Section AND any Material (including photographs) which you use/reproduce must credit the source as "The Finding Sydney Foundation" and, as an option, you may also link the source statement with the website address http://www.findingsydney.com/. The day began very early for all of us today. Actually for the past few days there hasn't been much difference between days and nights as they have all rolled into one long marathon session. Given what we have achieved in the 5 days since last Wednesday when we found Kormoran and the scene of the battle I wouldn't have wanted to miss a single second for having my eyes closed. Anyhow, we started at 5am for the final high-resolution sonar track over Sydney's wreck using the SM30 sonar. After another successful track the SM30 sonar was recovered in order to make way for its higher frequency sibling, the AMS60. Over the next two days more high-resolution sonar tracks are planned in order to accurately map all pieces of wreckage in preparation for the ROV video investigations that will begin next week. Two key members of our search team have been the DOF surveyors Nigel Meikle and Steve Bagnell. They have really excelled over the past couple of days making sure that our navigational tracks for all the high-resolution sonar runs were precisely placed to get the best sonar image possible. Nigel and Steve's challenge, working in collaboration with the Williamson off-line processor Mike Kelly and the vessel's officers of the watch, is to drive the sonar down a precise track with as much as 9,000 metres of cable out. It is equivalent to trying to thread a needle from about 10-feet away. There has been a fair amount of comment and surprise about how fast we located the wrecks, especially as most of our whole first week at sea was lost due to technical problems and bad weather. Considering that I truly felt the search could become prolonged and last as long as 45 days, I myself am impressed with how quickly we found the wrecks - but not completely surprised. Right from the start I was quite confident in the quality and veracity of the German accounts about where the action took place, even though there were many other researchers who strongly took an opposing view. It would be impossible for me to fully explain my research and plotting methodology in a simple blog like this, so perhaps the best thing is to show pictures of my actual reconstructed navigational plot and corresponding search boxes. The one bit of analysis I would like to mention, which I think did help in finding the wrecks as quickly as we did, was a leeway drift analysis which was literally completed the day before we departed Geraldton. This analysis attempts to use the known pick-up position of the first life-raft recovered after Kormoran sank and an estimate of the winds and ocean currents over the 82 hours the life-raft was drifting to back-track to a probable sinking position for Kormoran. The analysis sounds simple and straight forward, but in fact it is very complex because of the difficulty in estimating the actual conditions that prevailed 67 years ago. I was helped in this analysis by three experts I would like to acknowledge here. Len van Burgel, with assistance from the Australian Bureau of Meteorology, conducted an incredibly thorough estimate of wind conditions that constituted a major improvement over similar studies done decades ago; Dr. David Griffin, Research Scientist and CSIRO project leader of Bluelink II based in Hobart, used his Bluelink dataset on ocean currents to estimate their effect on the life-raft's drift; and Art Allen of the U.S. Coast Guard's Office of Search and Rescue provided helpful advice on leeway factors. I am extremely grateful for their assistance and professional advice. Above Photograph - David Mearn's navigational reconstruction outlining the larger 1,768 sqnm search box for the Kormoran search and the smaller 360 sqnm search box for Sydney in red pencil. The final wreck and battle site locations are also plotted. 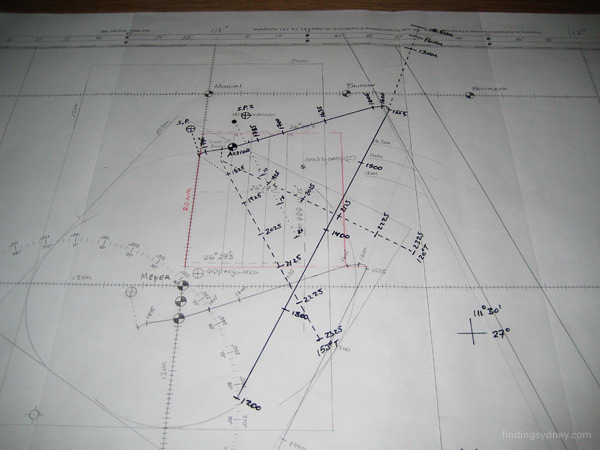 Above Photograph - This picture shows the overlay of Kormoran and Sydney's tracks used by David Mearns to assess different navigational scenarios by moving the overlay over the chart. Above Photograph - Electric Pictures cinematographer Ullrich Krafzik and Lieutenant John Perryman read the order of service. 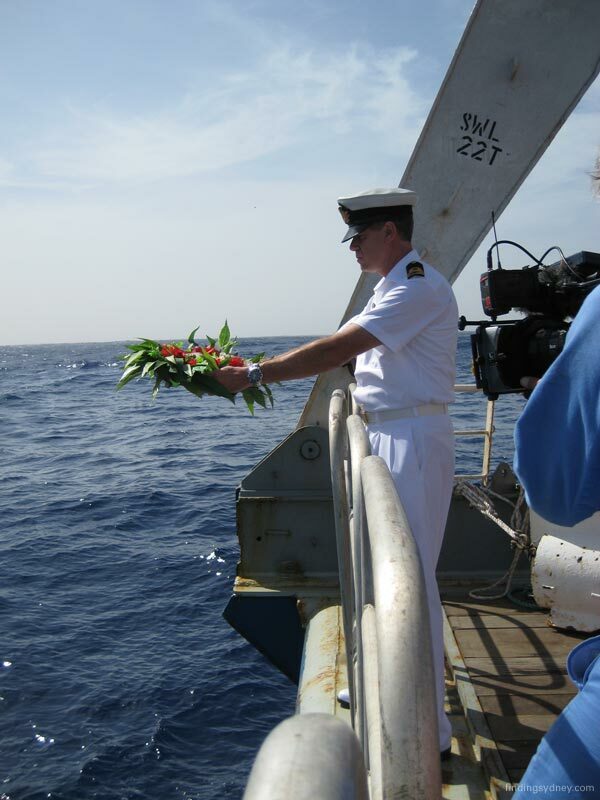 Above Photograph - David Mearns casts a commemorative wreath over the transom. Above Photograph - The commemorative wreath drifts over the wreck of HSK Kormoran. At 5.15am we were coming up to another parallel pass on the wreck of HMAS Sydney. Before us lay, without any shadow of doubt, a light cruiser. What appeared to be substantial damage to the bow of the ship became a focus for attention and further analysis. Later we began the long exercise of bringing up the SM30 fish. By 11.30am we were once again alongside the Kormoran, and John Perryman conducted a simple and moving service for the 80 German sailors who lost their lives in this place on 19 November 1941. Ullrich Krafzik, the German born cameraman from Electric Pictures read the naval ode, and David Mearns laid a wreath. Although it was noisy against the ship’s engines, which couldn’t be stopped at this point in time, all the team who were able to assemble, were on the back deck. 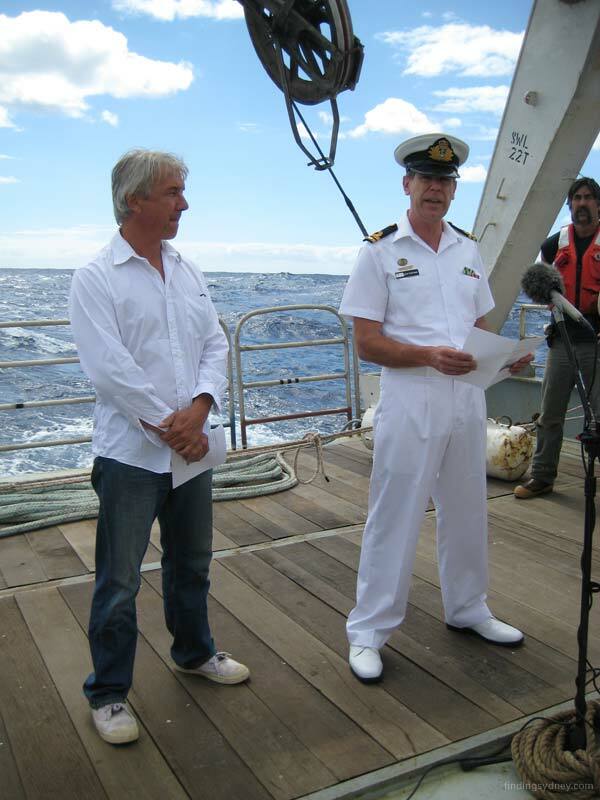 We adjourned to the mess room where David read to the whole ship’s company the congratulations and well wishes from Prime Minister Rudd and the chairman of Finding Sydney Foundation, Ted Graham. I spoke of the many messages of thanks we had received from the families of the crew lost in HMAS Sydney. It seemed from their messages that the whole nation was awash with emotion and tears at our news and I passed on the families words of gratitude. Late in the afternoon the SM60 was deployed for a test run and a technical hitch saw it returned once more to the ship. Later tonight we hope to begin collecting high density sonar of the Kormoran before moving on to the battle site and lastly tomorrow we will be back with Sydney, where we will conduct another service. With today’s dawn came a feeling of great expectation, knowing that news of yesterday’s remarkable discovery would soon be broken. However, we still had work to do and this involved conducting a final high resolution run over Sydney’s wreck with the SM30 side scan sonar. At 05:21 we commenced our pass, and what a pass it was. Before long we were rewarded with an amazing vista of Sydney’s wreck casting a near perfect acoustic shadow onto the seabed. 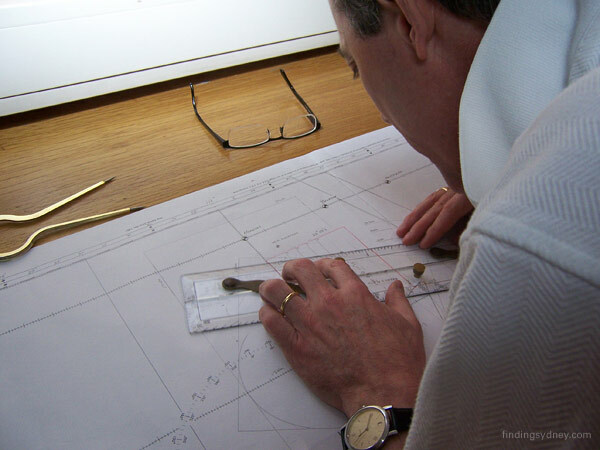 The high points and low points of this shadow allowed David Mearns to gauge both height and breadth of the shipwreck and also make a number of other important observations. The concentration of high and low points grouped together in the centre of the wreck was one of the distinguishing features we were looking for and characteristic of the wreck being a ‘man of war’. Soon the debris field also came into view and again a large piece of wreckage was visible. These images were immediately transferred ashore via the internet. With the run completed at 05:58 our thoughts again turned to the impending announcement. Because of the two hour time difference between Western Australia and the eastern states and territories we didn’t have long to wait, and it was with an enormous sense of pride and satisfaction that we learned that the official announcement concerning our discovery of HMAS Sydney had been made. Before long the enormity of the announcement became apparent to us as we followed its progress via the internet. At this point my thoughts turned to the relatives of those lost in Sydney and in particular those who have supported our collective efforts throughout this historic endeavour. Meanwhile the SM30 tow fish was recovered for the last time. The plan now is to switch to the AMS60 which we will use to sweep both of the wreck sites and the battle position in an attempt to obtain sonar images of an even higher resolution. We then steered north to the Kormoran’s position which would be the starting point of a southerly run back to Sydney’s location using the AMS60. As we arrived in Kormoran’s position our thoughts turned to commemoration as this was likely to be the last opportunity during this phase of the operation to conduct a service in this location to commemorate the fallen Kriegsmarine personnel who died in Kormoran. Having now changed into a uniform more befitting the occasion I led a short but solemn unofficial service which culminated in the laying of a wreath over Kormoran’s wreck, the playing of the Last Post followed by one minute’s silence. As we now make our way south to the site of Sydney’s wreck we are preparing a similar order of service to commemorate Sydney’s gallant crew and it is likely that this will be held tomorrow. Currently the AMS60 is being prepared for deployment over our stern in readiness for the first of this evening’s sonar passes over Kormoran’s hull. 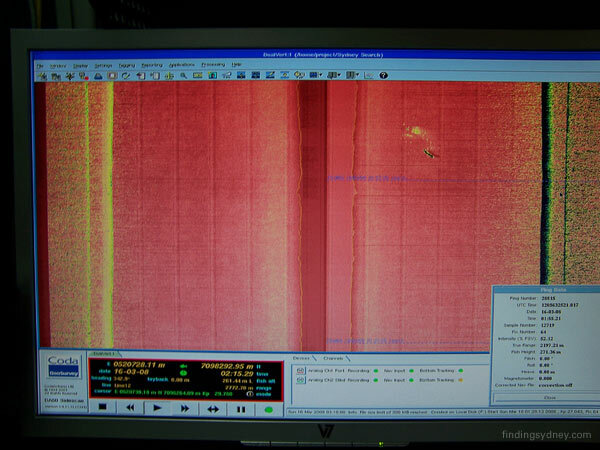 At 11:03 (AWT) on Sunday 16 March 2008, a small dark shape was detected coming into view on the starboard side of our SM30 side scan sonar display. In an otherwise featureless seabed. David Mearns soon classified this contact as being man-made, displaying all the characteristics of a major shipwreck. Within minutes a debris field came into view confirming this belief. The wreck was measured and its position plotted in relation to the wreck of Kormoran and what is firmly believed to be the battle site. Our target was located approximately 10.5 nautical miles to the south-east of the battle site and 12.2 nautical miles from Kormoran. We soon concluded that the modified Leander class cruiser, HMAS Sydney (II), sunk with all hands on 19 November 1941, had been found in 2,468 metres of water. Her position was recorded as being 26° 14’ 37” S 111° 13’ 03” E.
As with the Kormoran find, news of this discovery was promptly communicated to the Finding Sydney Foundation for on-forwarding to the appropriate shore authorities. News of our discovery, only an hour-following the Prime Minister’s announcement concerning the discovery of Kormoran, was received with great emotion and jubilation by The Finding Sydney Chairman, Ted Graham. With a sense of euphoria onboard we immediately began to make plans to carry out several high resolution sonar passes over Sydney’s wreck. The first of these runs commenced at 18:35 using a 3 kilometer swathe on the SM30 side scan sonar. This run gave us the ability to better measure the wreck and some of the larger pieces of wreckage in the debris field. The run was completed at 18:47. A second high resolution pass with the SM30 set to operate a 1500 meter swathe began at 23:00 and produced a good image of the wreck lying on the seabed displaying a clear acoustic shadow. This pass also provided an indication that part of Sydney, possibly her bow, may have broken away from her as she limped away causing her to sink. This is a tentative assessment which will have to be confirmed using a suitably equipped ROV with cameras. The dimensions of the wreck combined with its position in relation to the wreck of Kormoran and the scene of action leave me in no doubt that this is the wreck of Sydney. During the next few days further high resolution runs will be conducted over her wreck and commemorative services will be held for the crews of both Sydney and Kormoran. This has been a monumental day and one which I hope will bring some comfort to the relatives of those lost in her. Above Photograph - The wreck of Sydney as revealed for the first time in this wide swathe (6km) sonar image. The wreck is clearly visible on the starboard (right) channel adjacent to a well defined debris field. The height of the wreck above the seabed is causing the dark acoustic shadow just to the right of the wreck. Above Photograph - For this second sonar track we narrowed the SM30 sonar swath to 3km and approached the wreckage on a reciprocal course which is why the image is reversed from above. The wreck and the debris field are better defined in this image, but the main reason for a reciprocal track is to help determine a more accurate position for the wreck on the seabed. Above Photograph - Sydney 2nd Pass Zoom: This image is a repeat of the image above but zoomed in on just the wreck and debris field. We suspect that the large piece of debris at the lower right hand corner of the image may be a section of the bow which broke away from the hull. Above Photograph - Image & Model: The third sonar track was narrowed yet again to 1.5km and in doing so revealed the hull and debris field in the most detail to date. Again, the large piece of wreckage at the top of the debris field stands out as the biggest piece, other than the hull itself. 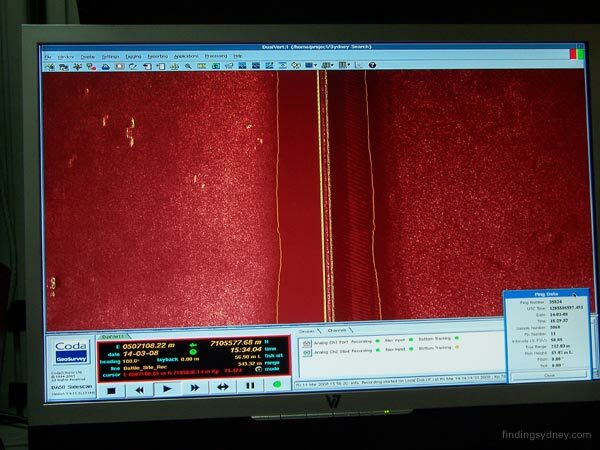 Above Photograph - Sydney Hull: This sonar image is a magnification of just the main hull from the third sonar track. The acoustic shadow to the left of the hull is used to help identify structures that have height. For example we believe that the tallest shadow could be being caused by Sydney’s superstructure. Careful analysis and measurements of the hull length suggest that while the hull is sitting upright on the seabed and is largely intact, a portion of the bow could well have broken away and that this event was the trigger that finally caused Sydney to sink. Above Photograph - Search Director, David Mearns plots the location of Sydney’s wreck thus solving one of the most enduring maritime mysteries of the 20th century. 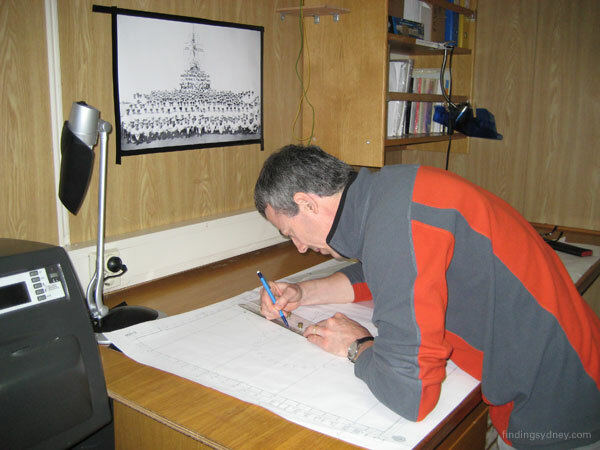 David is plotting the position on a Mercatorial Plotting Sheet – the last of four he has made over a period of 5 years whilst conducting his own manual re-navigation of the ship’s tracks and movements during and after the battle. 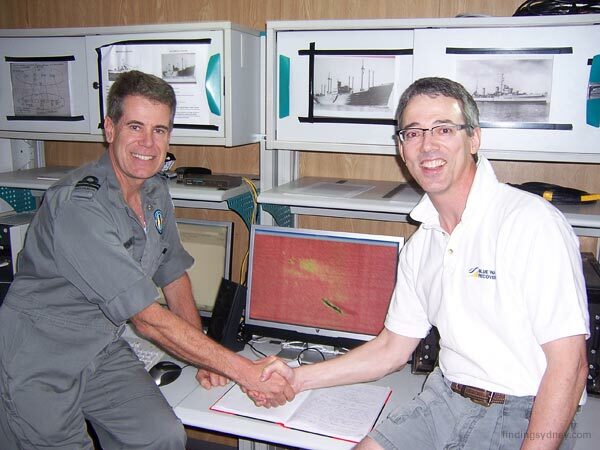 Above Photograph - David & John: A moment of delight shared by Search Director, David Mearns and Lieutenant John Perryman, RANR knowing that the wreck of Sydney had been found ending 67 years of uncertainty about her final resting place. I woke with a headache this morning. I wanted to be in the survey room between 8am and noon as that was when we thought Sydney would appear on our screens on this track line. The Williamson crew had been tracking a tiny debris trail from the battle area and indications were that this search line would be successful. At exactly 10:03 am a large piece of wreck unfolded on the screen with a small associated debris field. The surrounding geology was dead flat sandy bottom. There she lay, looking proud and poignant. HMAS Sydney had been found. John Perryman and I had become adept students in reading the data over the past couple of weeks and we, like David Mearns and the Williamson and Associates crew, knew that this was what we had been looking for. This was the ship that had taken the hopes and dreams of 645 families to the bottom of the ocean. Here in a relatively small area of ocean we located one ship suffering a catastrophic explosion, a battle site, a small debris trail, and another ship approximately ten nautical miles away sitting proudly on the bottom, all as described by the eye witnesses to this action between HSK Kormoran and HMAS Sydney. There was jubilation from all, and a few tears from me. David, John and I were thrilled. The Geosounder crew, who had become part of this great project, joined with the Williamson team shaking hands. I thanked the crew and Williamsons on behalf of FSF, and Geoff led a cheer for me which was nice. I just wished that Ted and the other Finding Sydney Foundation Directors were standing beside me. David then rang Patrick and Ted. I spoke to Ted, and this six foot seven inch giant of a man was overcome. We unashamedly cried together and he asked me if I was certain. I am. Even though we deserve our moment of jubilation after such a long and difficult journey to this moment in time, we have not forgotten that this was where we lost our men. I went up to the back deck and leant over the railing and cried and gave thanks. I believe this wreck will bring closure. She sits almost proudly on the bottom. If Sydney had blown like Kormoran there would be little sense of closure, but here in such a large piece and in a depth of water where we will shortly activate the ROV part of the program, we will give the kind of images required for everyone to finally be at peace with this sad story. We turned the ship around and by 18:35 we were back on site and doing a smaller swath run. The plan is to do a few more of these from different angles before changing the fish over to the SM60: another long night ahead before the official announcement tomorrow. 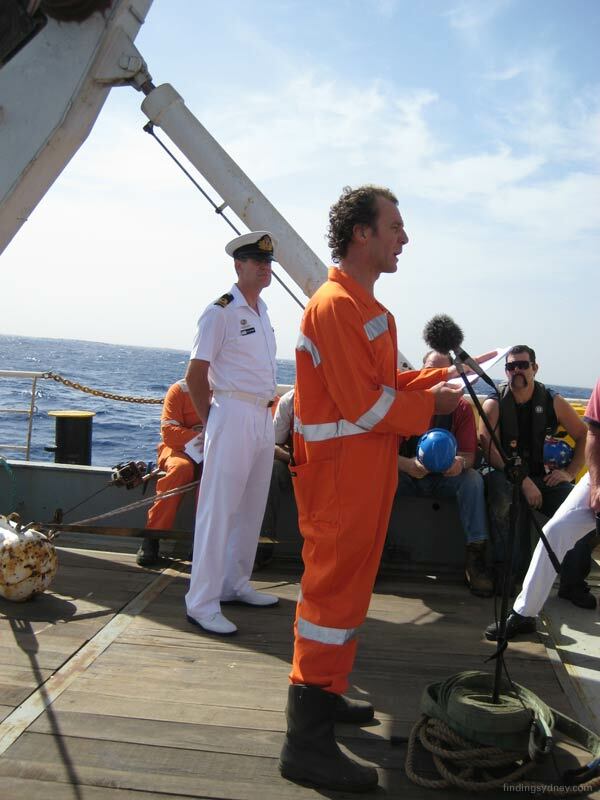 The wreckage of the German Raider HSK Kormoran was found by the search team on board the SV Geosounder at 17:30 (AWT) on March 12th, 2008 in the approximate position 26° 05' 49.4" S 111° 04' 27.5" E. With Kormoran’s sinking position established, and the identity of its wreckage confirmed on the basis of high quality sonar imagery, the search for HMAS Sydney (II) has been localised to a most probable area and this search is currently ongoing. The wreckage of Kormoran was first found on Line #09 in the northeast quadrant of the designated 1,768 nm² search box. Line #09 was the fourth search trackline to be run and the SM30 sonar had been deployed for approximately 64 hours in the search box (excluding the time for turns) when the wreckage was first discovered. The depth of the site is approximately 2,560 metres. The wreckage fits perfectly with what we know and expected to see for Kormoran from testimony of the German survivors. The vessel suffered a catastrophic explosion after its cache of some 320 mines stored in the after cargo holds 4, 5 and 6 detonated. This section of the vessel’s hull has been obliterated. There are 4 large pieces of hull structure remaining. The two largest pieces are located hundreds of metres outside the main debris field and approximately 1,200 metres from each other on a line running roughly north-south. The distant locations of these pieces indicate that they sank after the explosion and/or took different glide planes in their descent to the seabed. The largest piece of hull measures approximately 106 metres long by at least 20 metres wide and has been identified as the forward half of the ship that extends roughly from the engine room to the stem. It is sitting upright on the seabed with a height of approximately 13 metres. 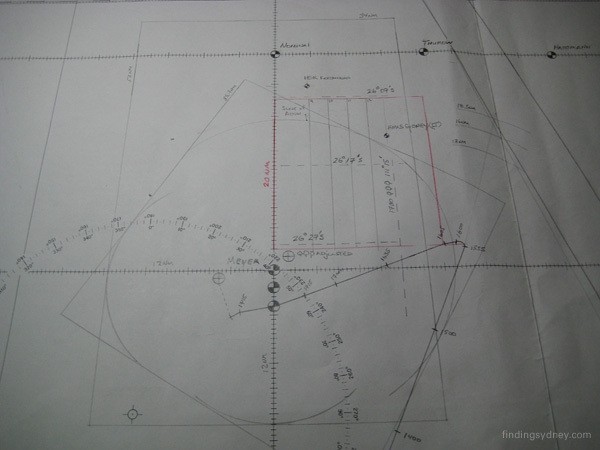 The high resolution sonar lines made in this area were focused on this piece because it offered the greatest chance to confirm the wreck as Kormoran by using the acoustic shadows “thrown” by the bow’s shape to see if it matched Kormoran’s bow. In addition to matching the known breadth of Kormoran, which was significantly greater than Sydney’s breadth, the piece was revealed to have a raised forecastle deck like Kormoran. The forward part of the bridge superstructure was intact at roughly the correct distance from the stem. Lastly, the sonar imagery indicates an opening in the deck in approximately the correct position for the forward cargo hold. The other large pieces of hull were not able to be identified. However, based on their dimensions and position relative to the blast, it is possible that these pieces are the stern/poop deck and at least part of the engine room/hull structure aft of the main bridge superstructure. On line #09, less than 4 nautical miles south of the Kormoran wreckage position a separate and distinct debris field was found at 19:16 (AWT) on March 12th, 2008. 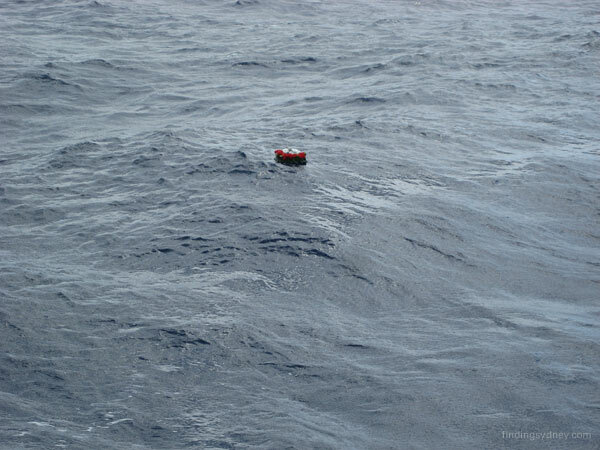 This debris was found to be widely scattered over a distance covering 1,700 metres and lying at a depth of 2,740 metres. However, it was not associated with any major shipwreck targets and was very sparse compared with the dense debris field found at the centre of Kormoran’s wreck location. As Kormoran left the battle intact and was known to have drifted north with the prevailing current and winds after losing engine power, it is logical to conclude that this debris could not have come from Kormoran. However, the location of this wreckage in relation to the known movements of Kormoran in the final stages of the battle and her estimated leeway drift before sinking, does indicate that it marks the actual scene of action between Kormoran and Sydney. This debris, therefore, must have come from Sydney as we know she had been gravely damaged by a torpedo hit and was being heavily shelled by Kormoran and in such a situation would have been losing pieces of structure and other parts of the ship overboard as was vividly described by the German eyewitnesses. Finally, the approximate NNE – SSW trend of this debris trail fits with the course of Sydney as she altered course south to avoid Kormoran’s fire. Confirmation of Kormoran’s sinking position, as well as the location of the action between Kormoran and Sydney, has allowed me to refine the most probable sinking position of Sydney and outline a new search area for her wreck. This search for Sydney is currently ongoing. Compared with the extremely large search area for Kormoran the initial search area for Sydney is relatively small and covers several hundred square nautical miles. Key to this initial search area are certain assumptions made about how far Sydney could have travelled away from the scene of action given the grave damage she had suffered – now proven by the extent and size of her wreckage found at the scene of action – and how long she could have remained afloat in such extreme condition. Based upon the location of Kormoran, and the high quality sonar imagery that is being collected by the Williamson and Associates sonar team, I am confident that if the wreck of Sydney lies within our search area we will find her. Should this initial search area prove unsuccessful, the search area will be enlarged until the wreck of Sydney is found. Above Photograph - Kormoran Wreckage 1: Sonar image showing the entire wreckage field of Kormoran when first located on 12th March. The object at the top of the screen with the dark acoustic shadow to its immediate right is Kormoran’s bow broken just aft of the bridge superstructure. The bright mass to the left and below the bow is the main debris field created as a result of the catastrophic explosion suffered by Kormoran when her cache of mines detonated. The object at the bottom of the screen is a large piece of unidentified hull structure measuring 31m x 25m x 12.7m high which gives a good idea of the scale of the wreckage. Above Photograph - Kormoran Wreckage 2: This is the second sonar image of Kormoran’s entire debris field taken at higher resolution. In this image the bow and its associated acoustic shadow are now at the bottom of the screen and individual pieces of wreckage in the debris field can now be resolved. This entire image covers an area 3,000 metres wide. Above Photograph - Kormoran Bow 1: This image of Kormoran’s bow is a magnification of the previous image. This section of Kormoran’s hull measures 106 metres long by at least 20 metres wide, and extends from the tip of the bow to just aft of the bridge superstructure. Importantly, the beam of Kormoran’s hull (20.2 metres) is nearly 3 metres wider than Sydney’s hull (17.3 metres), which is a key measurement that allowed us to confirm the wreckage as Kormoran’s and not Sydney’s. Above Photograph - Kormoran Bow 2: This final image of Kormoran’s bow (with the stem at the top of the image), collected using the highest resolution of the SM30 sonar (800 metre swathe), shows the crucial detail in the acoustic shadows trailing off to the right that confirmed the wreck as Kormoran’s. Kormoran has a flared bow with a raised foc’sle deck above the main deck. This structural detail, particular to Kormoran and not to Sydney, is evident by way of the acoustic shadow at the top of the image. This long shadow could only be caused by the wreck having the type of flared bow and raised foc’sle deck that Kormoran had. Fortunately, this section of hull is sitting upright on the seabed which allowed such analysis of the acoustic shadowing. The separate acoustic shadow at the bottom of the image is caused by the bridge superstructure of Kormoran, which has been measured to be in the correct position relative to the stem. 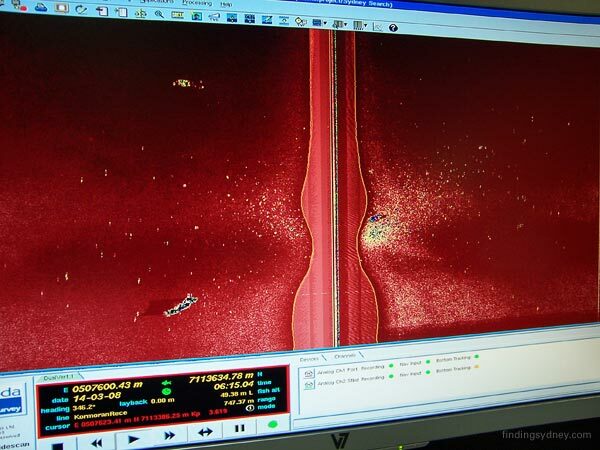 Above Photograph - Kormoran Debris 1: This sonar image shows the highly concentrated debris field left in the wake of the catastrophic explosion suffered by Kormoran. This explosion occurred when Kormoran’s cache of 320 mines detonated after the scuttling charges were set. The mines were stored in holds 4. 5 and 6 on the ship and this section of the hull has been obliterated by the enormous blast. Each yellow and dark blue sonar contact set against the red background of the seabed represents a single piece of the hundreds of individual pieces of wreckage debris scattered throughout the debris field. Above Photograph - Kormoran Hull Piece 1: This is an unidentified piece of Kormoran’s wreckage that is surely a major structural section of the hull given its size of 31 metres by 25 metres by 12.7 metres high. Remarkably, the large piece of Komoran’s hull was found 1,200 metres away from the bow. 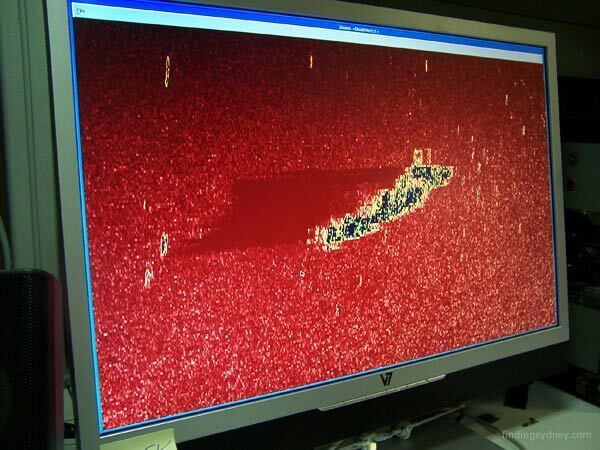 Above Photograph - Battle Debris 1: This sonar image, covering a 750 metre expanse of the seabed, shows the wreckage found in the location four nautical miles south of Kormoran’s wreck site. The wreckage is widely scattered over a distance covering 1,700 metres and fits with the scenario of Sydney being torpedoed and heavily shelled by Kormoran resulting in the loss of pieces of structure and other and parts of the ship. The approximate NNW – SSW trend of this debris trail fits with the course of Sydney as she altered course south to avoid Kormoran’s fire. Above Photograph - Battle Debris 2: While most of the wreckage found at the battle site is smaller, this piece is very large and indicates the severe damage suffered by Sydney. 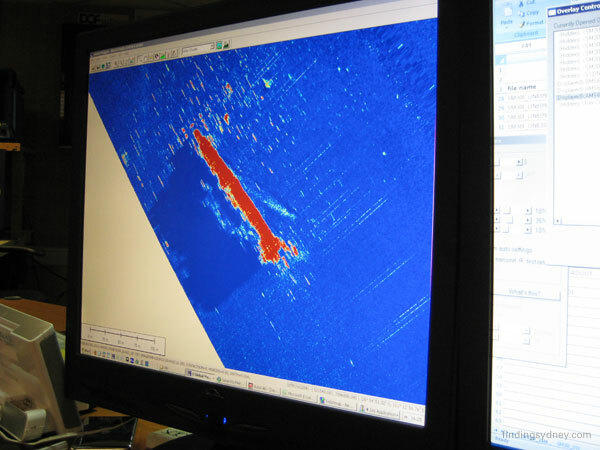 The larger piece in this high-resolution sonar image measures 33 metres by 19 metres with a height of 13.3 metres off the seabed as evidenced by its very long acoustic shadow. The smaller wreckage at the bottom of the screen with its own acoustic shadow measures 11 metres by 11 metres and 5 metres high by comparison. 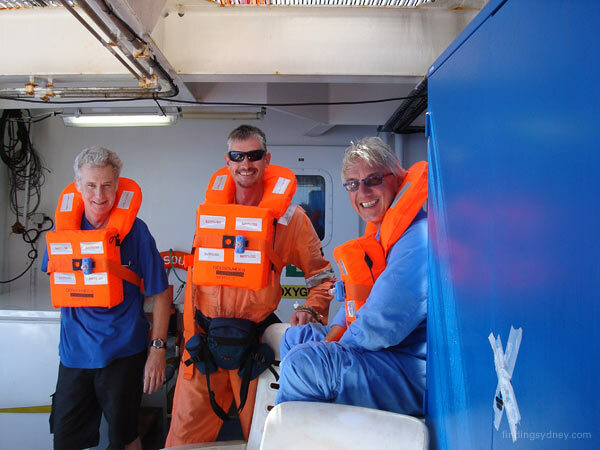 During the forenoon of Wednesday 12 March 2008, the HMAS Sydney (II) search team commenced a survey run down line number nine through the designated search box. Geographically this line ran from north to south along 111° 04’ 38”E of longitude and was 52 nautical miles in length. 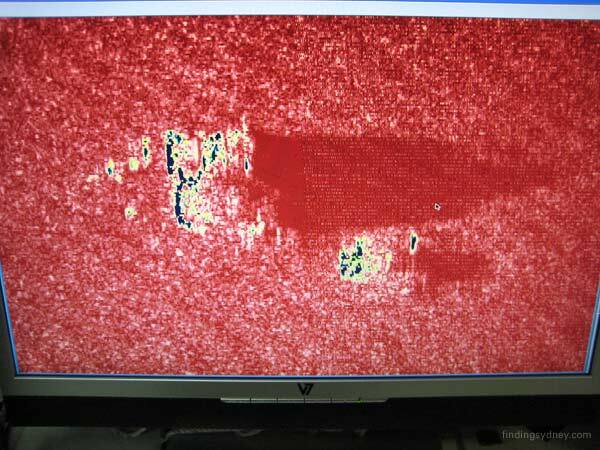 At 17:30 a small dark contact appeared at the top of the SM30 side scan sonar display which we were monitoring in our survey room. David Mearns immediately classified the target as man made due to the characteristics it displayed such as hard straight edges, shadow and its horizontal orientation on an otherwise featureless seabed. During the next hour the first evidence of a debris field began to appear and before long we were viewing a centralised concentration of debris indicative of a powerful and catastrophic explosion. This was consistent with the German account of the final destruction of the raider HSK Kormoran, scuttled by her crew following the engagement with HMAS Sydney (II). At the time of her scuttling she was carrying a full cargo of some 300 sea mines, each packed with high explosives. Approximately 1200 metres to the south of the debris field a much larger target was detected, seemingly in tact, which was tentatively classified as being the forward section of the Kormoran. The position of the centre of the debris field which represents the site of the scuttling and resultant explosion is 26° 05’ 49.4” S 111° 04’ 27.5” E in a depth of 2560 metres of water. As we continued to the south along our survey line, several further contacts were detected approximately four nautical miles from the first wreck field. 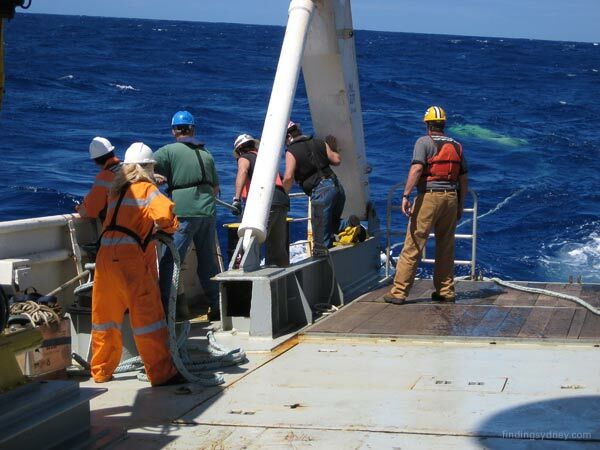 Although these contacts displayed hard edges and man-made characteristics, the absence of a debris field led us to conclude that this could be wreckage which may have been blown from either vessel during the action. 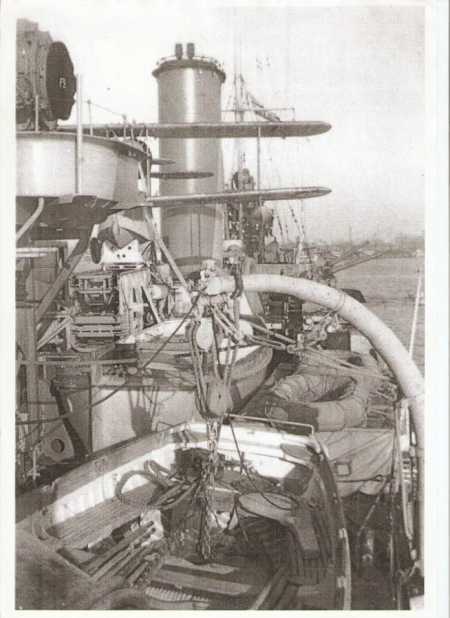 Sydney is reported to have received major hits from Kormoran early in the engagement which included losing the top of the housing of her ‘B’ gun turret. She also suffered a torpedo hit beneath her two forward turrets. It is likely that this wreckage could well have been shed from Sydney as a result of battle damage and lie in the vicinity of the initial engagement. There was, however, no evidence of a major shipwreck in the immediate vicinity of these contacts. News of the potential discovery of Kormoran was reported through the Finding Sydney Foundation to appropriate Government authorities ashore while the Geosounder continued its run to the south. During the passage south, the data collected from the shipwreck field received further scrutiny from David Mearns and specialists from the Williamson team who concluded that the wreck displayed characteristics conforming closely to that of the Kormoran. Notwithstanding this positive affirmation it was decided that at the end of the next south-north run we would re-visit the first wreck field and make a high resolution pass of it with the SM30 to gain absolute proof that our belief that this was Kormoran was correct. 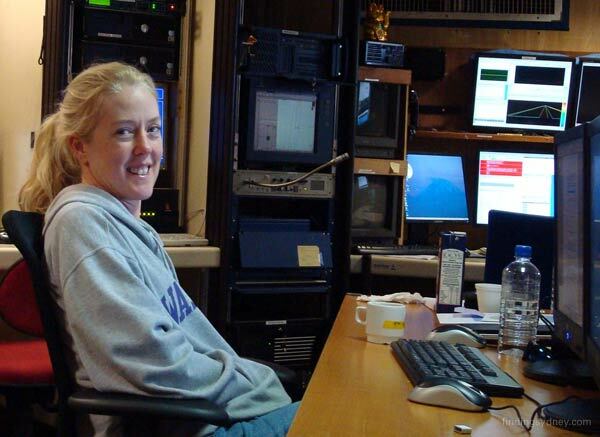 On Friday 14 March 2008 we were again in the northern end of our search box where we began the first of two high resolution passes. The first pass began at 14:30 and provided some useful additional data. The second pass commenced at 19:32 and soon revealed evidence of shadow on the large hard contact which we had tentatively classified as the forecastle section of Kormoran. This shadow provided further clues concerning the size of this contact which is estimated to be approximately 106 metres long. Two large pieces of wreckage were also detected in the centre of the debris field along with many other hard contacts. The dimensions of the largest piece of Kormoran’s wreck along with other distinguishing features such as her rising flared bow section were compared to the characteristics of Sydney. From the dimensional information before us when compared to Kormoran’s drawings, it was concluded that the size of the wreckage was not commensurate with that of a modified Leander class cruiser but was consistent with the ship data held for HSK Kormoran. Of significance was the beam measurement of the contact which very closely matched the 20.2 metre beam of Kormoran but not the 17.3 metre beam of Sydney. It is therefore our considered opinion that this was indeed the wreck of Kormoran lying in close proximity to clear evidence of a catastrophic explosion. We then continued our late night survey to the area where we had previously detected additional wreckage, and tentatively classified as the site of the battle between Sydney and Kormoran. We commenced the start of our high resolution run down the line at 23:13 and in the early hours of Friday morning we relocated the several hard pieces of wreckage in position 26° 09’ 45.9” S 111° 04’ 07.2 E. Some of these pieces were measured and found to be surprisingly large with one piece measuring 33 metres x 19 metres and standing 13.3 metres high off the seabed casting a distinctive acoustic shadow. At this stage we can only speculate on what this large piece of debris might be. This leads us to believe this could be wreckage blown from Sydney during her engagement with Kormoran. While these discoveries took place several days ago it was considered important that they be thoroughly analysed before any official statement was released. Out intent now is to continue the search in a box which has been further refined by David Mearns to fulfil our ultimate goal and locate the wreck of HMAS Sydney (II). 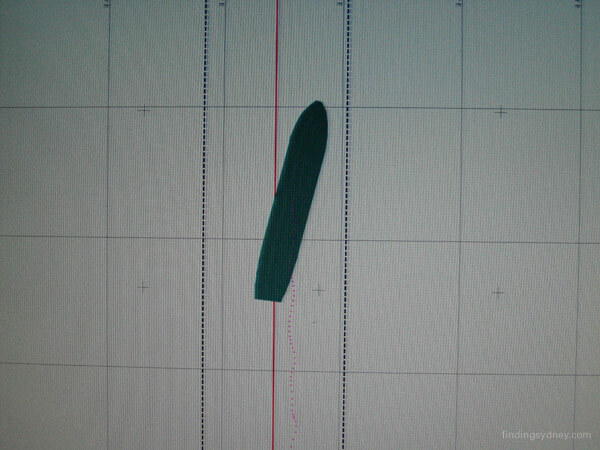 After a week at sea and dogged by bad luck, by Wednesday 12 March we were finally in survey mode. Late in the afternoon John, David and I were sitting in our work space discussing the day and at the same time keeping an eye on our sonar screen. It was exactly 17: 30 and John was the first to comment on the target beginning to emerge. Before our eyes a spectacular vision of a huge explosive pattern appeared, together with two substantial pieces of debris. “That’s it” said David, and the excitement was palpable. I ran to call the Electric Pictures team so the screen could be filmed as it happened. The largest piece of debris certainly fitted the shape of a large section of Kormoran’s bow. The scenario unfolding on the sea bed fitted the description of the last moments of HSK Kormoran. It was quite sobering to comprehend that here, just five nautical miles south east of the 26S 111E marker, lay HSK Kormoran, and I took pause to remember that eighty German sailors did not survive this sinking. After returning from dinner to more screen watching as we headed south on our track line, it was obvious that at 19:30 we were entering the debris field of the battle site, some four nautical miles south of the Kormoran. Interrogations of the Germans had indicated that Sydney lost her B turret housing which was blown overboard during the battle, and here on the seabed was a large item. How quickly our fortunes have changed in just one day. We continued on in our search from HMAS Sydney, but on Friday our track line took us near the Kormoran position and we took the opportunity to do some high resolution work. We did two passes of the Kormoran position on Friday, the second at a 800m swathe and with the fish at altitude 40 meters. Finally we had absolute certainty that we were looking at Kormoran at 26 05 49S 111 04 27E in 2560 meters of water. It was 23:00, but the work continued as the Geosounder proceeded to the battle area with the same swathe and depth coverage. It was sobering to realise that we were passing through the actual battle site. More debris appeared, but we waited with baited breath for the large piece of debris we had tracked before. There was an audible gasp as it appeared on the screen because it was so large and cast such a shadow. It certainly looked like a very large piece of Sydney was blown overboard during the battle. By 0100 hrs on Saturday I called it a night, satisfied that David Mearns and the Williamson crew had given the Finding Sydney Foundation the best sonar pictures available of both the Kormoran and the battle site. I wished my fellow Directors was here to share this with me. But our task is not yet complete, and we continue on track to locate HMAS Sydney. We ran our first "higher-resolution" line late last evening past some suspicious looking sonar targets at the southern extremity of our search box. By higher-resolution, I mean that the SM30 sonar was operated at a narrower swathe setting than the normal 6km swathe we have used since the start of the search. 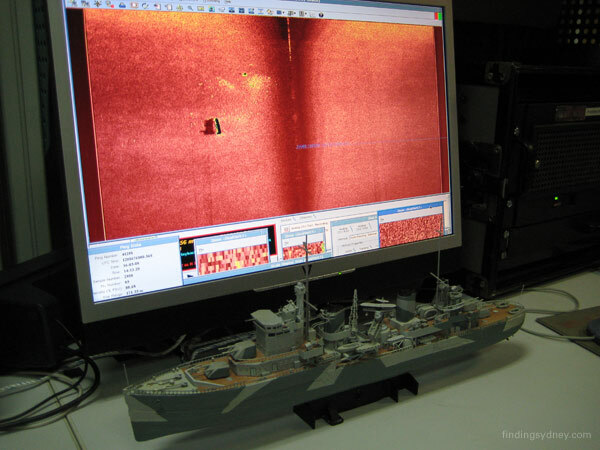 In simple terms the objective of a higher-resolution sonar pass is to magnify the targets in question so more detail is revealed in the sonar image making it easier to identify the objects. In this case the swathe was reduced to 3km, which can only be considered "higher-resolution" in relation to the SM30 sonar because most other high-resolution side-scan sonars have a maximum swathe of only 150 metres. The other benefit of a second sonar line is that the targets are seen from a different angle, which often reveals details unseen in the original sonar images. The targets in question turned out to be a field of outcropping rocks that were similar in ways to a wreckage debris field and thus needed to be double-checked. With these targets ruled out we turned our attention back north to the primary search box. When either the wreck of Kormoran or Sydney is found we have far more scope for collecting higher resolution sonar imagery to help confirm their identity and condition. The SM30 sonar can be operated at swathes as narrow as 750 metres and the higher frequency AMS60 sonar as narrow as 125 metres. We therefore have almost an infinite ability to collect progressively higher magnified sonar images of the wrecks. I think I speak for everyone on board the vessel that we are all looking forward to the opportunity to image the wrecks this way. Today I have been thinking a lot about the 645 men who were lost on HMAS Sydney. 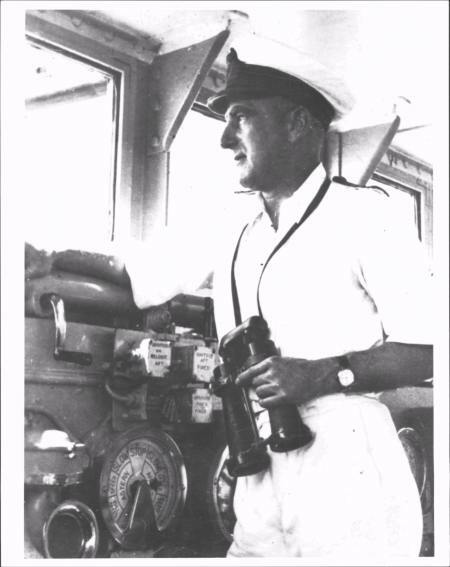 As secretary of the Geraldton HMAS Sydney Memorial Steering Committee and during my research, I came into contact with a large number of the relatives of the crew. I was honoured when they shared stories, letters and photographs of their loved ones with me. What becomes immediately apparent when I go through my collection of photographs is the collective youth that we lost on the 19 November 1941. One crewmember, eighteen year old Stoker 2nd Class, Jack Crowle had the foresight to think how devastated his mother would be if he was lost at sea. So he wrote a letter to be given to her if such an event transpired. In that letter of comfort, Jack told his mother to “remember that I lived and died an Australian and I don’t think there is any greater honour”. Jack also said that he was not afraid of death and would prefer to die in no other way than doing his duty. Keith Shegog did a remarkable job of collating many stories and photographs for posterity for the 60th Anniversary of the battle. 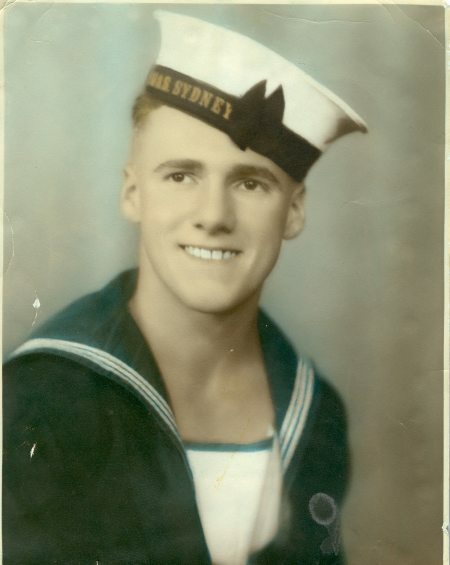 The Finding Sydney Foundation would like to build on his work to provide an online virtual memorial to the men of HMAS Sydney on our website. Our aim is to have a photograph and story for each of the men. If any relative would like to be part of this concept I encourage them to contact FSF via the address on the Contact Page of this website. Late yesterday we investigated a promising contact to the south which had been detected a few days ago during our approach run into line number 8. While it displayed some characteristics commensurate with being a man made object it was later dismissed as being a geological feature amidst a field of other vexing geological anomalies. Today we are slowly making our way north once again as we continue to gradually reduce the size of the main search box. 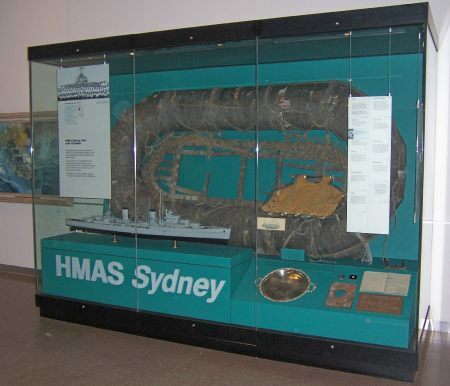 The most significant piece of wreckage attributed to HMAS Sydney (II) was a life raft known as a pattern No. 20 Carley float. This was recovered by HMAS Heros during the search for survivors on 28 November 1941 in position 24° 07’ South 110° 58 East. This type of floatation device was designed to provide life support for up to twenty men, twelve of whom could be accommodated within the float, while eight more could cling to lifelines attached to its outer shell. The Carley float was reported at the time to have been badly damaged by gunfire. This float was offered to the Australian War Memorial for preservation by the Naval Board in July 1942 and has been on display since that time as a tribute to Sydney’s crew. Above Photograph - Signal reporting HMAS Heros recovery of Sydney Carley float. After our early problems I am very pleased with how the search has progressed over the past couple of days. 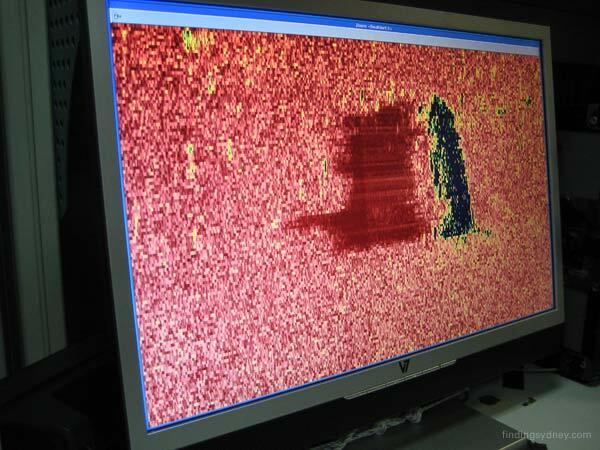 The Williamson & Associates SM30 side-scan sonar search system was selected for this project because it is one of the few commercially available sonars of its type in the world that is ideally suited to the specific requirements of this search. 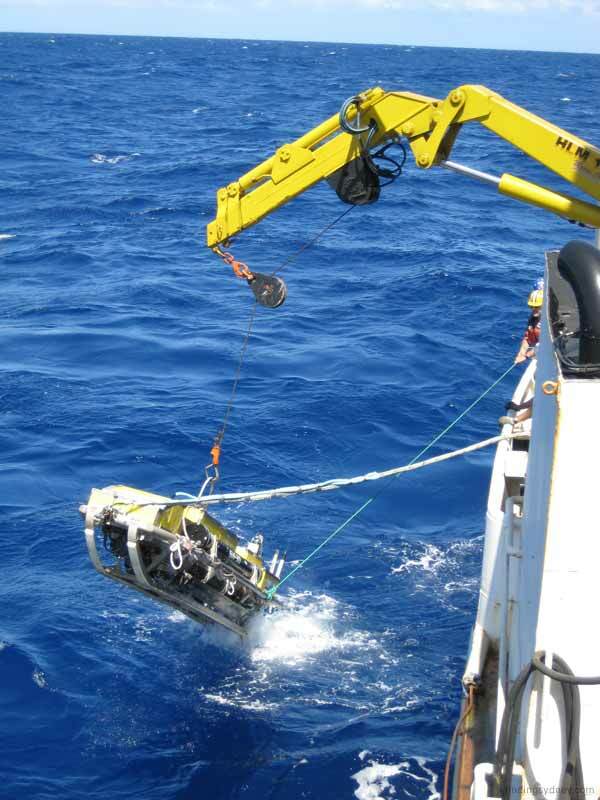 It can also be operated to a depth of 6,000 metres, which is well beyond our needs. The SM30 has two transducers, scanning to either side of the towfish, that operate at a frequency of 27 kHz and 30kHz. These low frequencies (mismatched to prevent acoustic crosstalk) enable us to search an area approaching 6km in swath width, whilst still being able to detect small man-made objects like 55-gallon drums. The SM30 has been successfully used on a number of important shipwreck search projects including location of the sidewheel steamer SS Central America and the submarine USS Grunion. The Grunion website has all the details of this interesting project (http://www.ussgrunion.com/). I have known Art Wright, the Party Chief of the W&A search team, for 20 years and it is good to be back at sea with him. We first met working on a landmark project for the oil and gas industry off the coast of Santa Barbara, California where we conducted the first ever pipeline route survey using a deeptow multi-beam sonar. Like me, Art enjoys search projects more than industry projects and he has been dipping into our library of books on the battle between Kormoran and Sydney. Above Photograph - Art Wright, the Party Chief of Williamson & Associates Search Team. Today I have spent much of my time in the survey room with the Williamson and Associates crew. I took the opportunity to sit in the hot seat flying the fish for a few precious moments myself. The technology is incredible. You can see exactly where you are, the precise GPS position, water depth, altitude of the fish etc, all of which is printed out and saved on computer file, where track lines and positions can be compared. It is hard to comprehend that we are scanning 3000 meters of sea bed on either side of our track. I can recommend the leisurely pace of 3 knots, although it takes nearly a good 24 hours to complete one track run. The work is ongoing 24 hours and night and day has become a little blurred. It does not matter out here if I go to bed at midnight or 2am. The Williamson crew changeover is a midnight and midday. 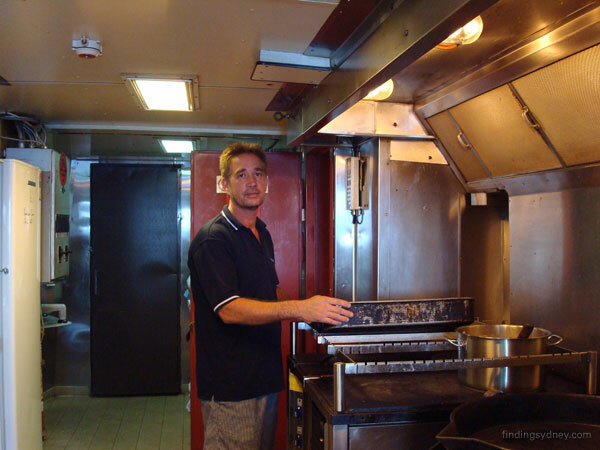 David’s off shift operator, Robert works a twelve hour shift commencing at 6pm, but David Mearns is on deck long hours after his shift officially ends. Today we completed our north-south run down line number 9 of the search box where we continued to see a mixture of sporadic geological features such as rocky outcrops and depressions as well as large tracts of featureless sea bed. Traveling at between 2-3 knots is slow going, but that is the nature of the work with the SM30 sonar equipment streamed astern of us on anything up to 9,500 metres of cable. With freshening winds we are now repositioning for further runs throughout the search area. HMAS Sydney (II) had four commanding officers during her six year commission in the Royal Australian Navy (RAN). The first was Captain J.U.P. Fitzgerald, Royal Navy (RN) who commissioned Sydney in England on 24 September 1935. He was succeeded by Captain J.W.A. Waller, RN in 1937, who remained in command until 16 November 1939 at which time Captain J.A. Collins, RAN assumed command. Collins was a graduate of the Royal Australian Naval College and the first Australian officer to command the light cruiser. It was under the command of Collins that Sydney captured the hearts and minds of the Australian population through her exploits in the Mediterranean theatre. Notably for crippling the Italian cruiser Bartolomeo Colleoni, and her spirited pursuit of her consort, the cruiser Giovanni Delle Bande Nere. 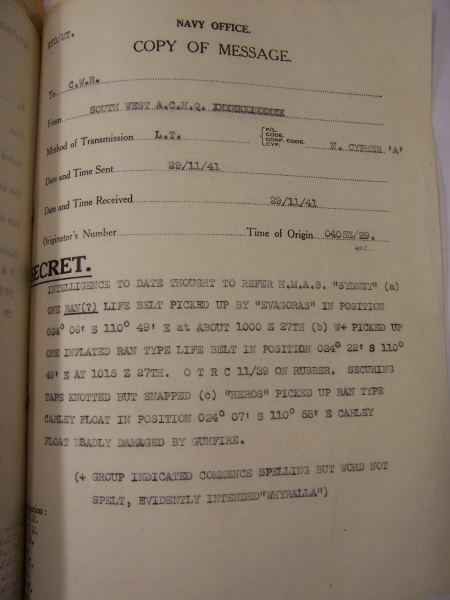 On returning to Australia, Collins was relieved by Captain J. Burnett, RAN, on 14 May 1941. 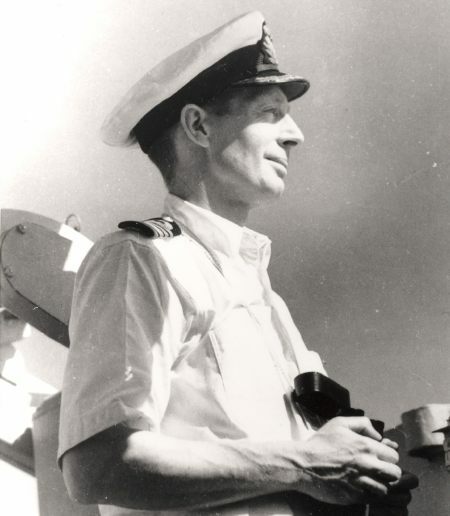 Captain Burnett went down with his ship following the fierce action with the German raider Kormoran on 19 November 1941. A few days ago I wrote about the rhythm of a search expedition - how a good rhythm consists of a search line followed by a turn to the next line repeated many times over with monotonous regularity. We are finally starting to get into such a rhythm and this bodes well for the location of Sydney. Excluding the time lost to technical problems and Cyclone Ophelia we have only been searching for less than 4 days so we are still in the very early stages of a search that I expect could take 30 to 35 days, possibly more. One of the most exciting aspects in any shipwreck search, but particularly this one, is that the wreck(s) in questions can be found at literally any time. We have three different image processing computers and monitors displaying the sonar imagery in real time, in addition to one very large screen that we mounted in the survey room especially for this expedition. So everyone can easily monitor the results of the search and there is no chance any important targets can be missed. But just to be safe, we also review the images on our two off-line systems at the end of each line to be absolutely sure. For a number of reasons I favoured the eastern side of the search box, which is why we are concentrating our efforts there first. We will be spending the next week searching there before shifting to the less fancied western side of the box. Unfortunately, the weather gods are still being uncooperative and we are expecting a surge of 25 to 30 knot winds tomorrow. We can't afford to lose any more time because of bad weather but we will just have to see the cards we are dealt tomorrow. Yesterday after our fire drill, I spent many hours looking at sonar screens. For a novice it was fascinating watching the geology, fault lines and depressions as they appeared more than 3000m below us. We had a few heart stopping moments as interesting geology was scrutinised and dismissed. The fact that we are out here searching is of paramount importance. We are here because of the hard work of the HMAS Sydney relatives and researchers who have kept this story to the forefront of the nation’s conscience. We are also here because the Finding Sydney Foundation Directors never gave up. I think it only fair to acknowledge the amount of work the five volunteer Directors of FSF have put in, particularly since the Commonwealth funding was signed off in October 07, especially our chairman Ted Graham. I know when I joined FSF I had no idea of the workload, and I’m a bit of a workaholic. It was with great relief when we welcomed our Project Manager, Patrick Flynn on board in mid November. The complexities of the tender process and the awarding of numerous contracts all had to be finalised expeditiously to enable us to be in the water in the optimum search weather window of the first quarter of 2008. We are funded by many individuals and relatives of the crew, but obviously we would not have made it to sea without the enormously generous support of the Commonwealth Government and the Western Australian and New South Wales State Governments. Above Photograph - Electric Pictures Team, Mathew, Chris & Ulle at the fire drill. Yesterday was a good day, during which we received some tantalizing underwater side-scan sonar imagery of contacts which were later assessed as being geological features. We completed our south-north run in the early hours of this morning and with our tow-fish streamed astern of us on approximately 4500 metres of cable, we then commenced our long turn in order to position ourselves for the next run down line number 9. Each of the survey runs are recorded and scrutinised at least twice by both David Mearns and an analyst from the Williamson crew to ensure that no contacts of interest have been missed. 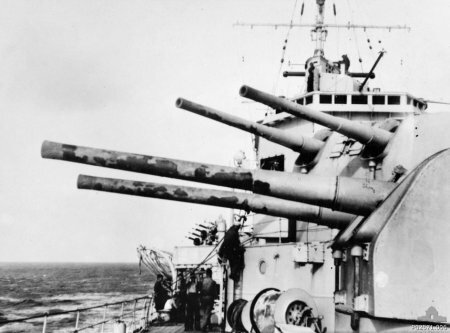 HMAS Sydney’s main armament consisted of eight 6-inch Breech Loading Mark XXIII guns, mounted in four twin barrelled Mark XXI turrets. Two of these turrets were mounted forward of Sydney’s bridge and main superstructure and were designated ‘A’ and ‘B’ turrets. The remaining two turrets were mounted aft of Sydney’s main mast and were designated ‘X’ and ‘Y’ turrets. These guns had a maximum range of 24,800 yards at a maximum elevation of 60 degrees. In layman’s terms they could fire a projectile weighing approximately 51 kilograms almost 22 kilometres which is roughly the distance from Central Station in Sydney to the city of Parramatta. Above Photograph - Sydney's forward turrets following a shoot. Note the blistering paint on the gun barrels. We've had such a lousy string of luck since the start of this search it was about time that things started to go our way. An enormous amount of effort by the Williamson & Associates technicians, in particular Carter Le, has been put in to get us up and running again. So we were all greatly relieved when the SM30 sonar was deployed in the early hours of the morning and the first images revealed the search was back on track. There is still far more seabed geology in the southern third of our search box to my liking (and I am a trained marine geologist!) and the technical gremlins haven't completely left us, but we are searching today and that's all that counts. 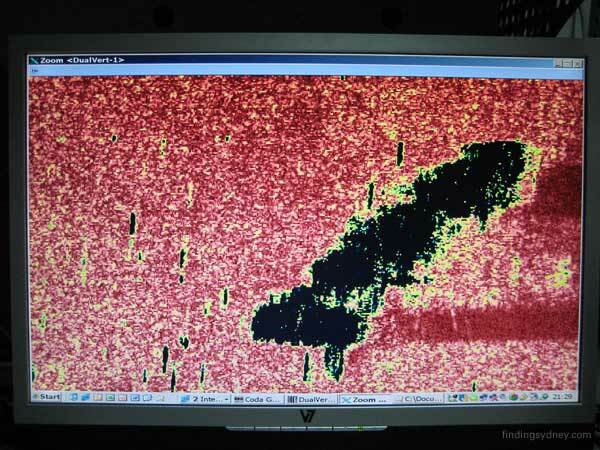 At one point in the current trackline the sonar images started to look very much like the kind of debris field I am expecting to see associated with Kormoran's wreck. As the SM30 sonar updates only once every 4 seconds (ping rate) the images scroll down our screens at the pace of a snail so it can take up to 30 minutes before a feature reveals itself as either geology or a bona fide target. The expectation and excitement in the room rises to the point it is palpable while the images are studied and analysed very carefully. In this case it was more seabed geology but our senses are being sharpened for the real thing. The trough I wrote about yesterday is still sitting on the coast of WA and doesn't look set to move east until Thursday. Meanwhile the winds and swell are still high but we are in a following sea today so the ride is comfortable. I have included a photograph of the navigation screen the helmsman uses to keep the Geosounder on track, which not only shows how well he is doing staying within our 25 metre guide lines but how he is doing it by "crabbing" down the line with the ship at a constant 15 degree angle to starboard. The crew of MV Geosounder come from all parts of the globe. Their usual work routine is five weeks at sea, followed by five weeks at home, and they thrive on this type of existence. I have come to look forward to my evening chats where we do a fair amount of philosophising about the “good old days” when we were young. The crew from Williamson’s and Associates are infectiously happy. They work as a great team, either deploying or recovering the fish in some very interesting sea conditions at all hours of the day or night, and then spend countless hours either monitoring screens or with the sonar under maintenance. My room mate Kelly is on her first deployment doing this type of work and I am in awe seeing her out there on the back deck doing her job alongside some big strapping men. It gives me great comfort on this trip to have the combined wealth of experience of Art Wright of Williamson’s and David Mearns on board. This is their day job and they do it professionally and without fuss. John Perryman is keeping us in high spirits with some absolutely amusing stories of life at sea, and anecdotes from the history of our Navy. 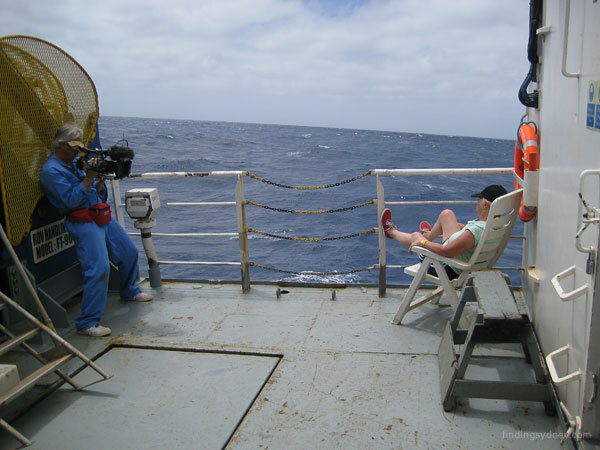 One of the hardest working groups on board are the three Electric Pictures crew who are everywhere – back deck, survey room, they even catch you having a nap on deck. Today was by far a much more positive and productive day. With the SM30 back in the water in the early hours of the morning we were soon heading into the southern end of our search box. It did not take us long to start picking up good paints of geological features in some areas while in other areas the sea bed appeared featureless. This was certainly a morale boosting victory following the testing times of the previous few days and it feels good to be back in our search box with our eyes fixed on our various monitors and sensors. Historical Anecdote: The Australian modified Leander class cruisers, Sydney, Perth and Hobart each carried amphibious aircraft for the purpose of reconnaissance, anti-submarine work and gunnery spotting. At the time of her loss, Sydney was carrying a Walrus aircraft mounted on a 53 foot long catapult located between her two funnels. 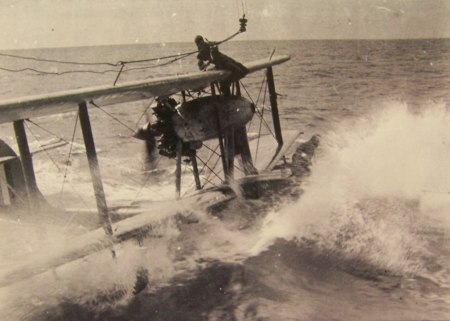 To launch the aircraft the catapult was rotated so that it pointed to seaward. From this position the aircraft would then be hurled into the air and take flight. It could also be lowered over the side of the ship by a crane for water take offs if necessary. This crane was also used to recover the aircraft from the water on completion of a sortie. This was often a difficult evolution in choppy seas as can be seen in the accompanying photograph. At the time that Sydney was lost, six members of the Royal Australian Air Force were serving in Sydney as members of her ship's company. They were responsible for the maintenance and operation of her Walrus aircraft. Above Photograph - The recovery of Sydney's aircraft could often be a difficult evolution. 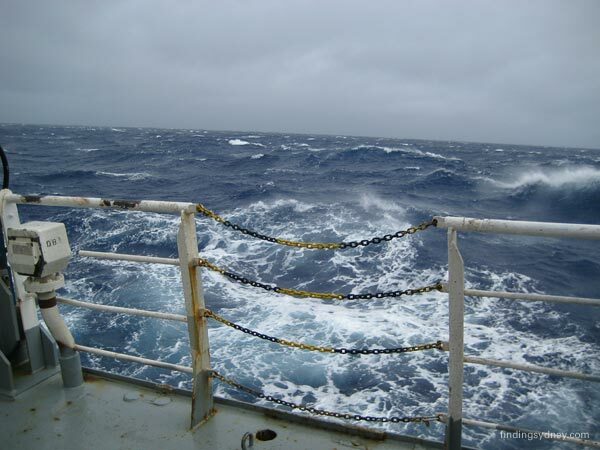 We have now been at sea for 8 days and are still being plagued by technical problems and unseasonably rough weather. A search line we started early this morning had to be aborted because I didn't feel we were getting good coverage of the seafloor. It is most important that whichever areas we search have been covered completely and that no gaps exist. Like a decorator painting a ceiling we call these gaps "holidays" and they are to be avoided at all costs. Apparently we owe the high wind and rough sea conditions we are experiencing to the West Australian Summertime Heat Trough, which has been sitting over the coast of WA for days. Because this low pressure trough is stationary it has been preventing more favourable high pressure systems from moving in over our location. Counting Tropical Cylcone Ophelia, this is the second weather disturbance common to WA that we have experienced in our 8 days. We still have sufficient time to achieve our objectives and find HMAS Sydney but I think the weather (and technical) gods owe us a break. Everyone on board the Geosounder is to working together, and supporting each other to get things happening. This is my first sea voyage, so everything is a new experience. My day begins with a nice hot, one armed shower, as I hang on to ride the moderate swells we are continuing to get. Then it is doing the shuffle to the dining room, where I am pleased to see it is not only me that stands with feet wide apart, with one hand on the cupboard as we serve ourselves from the incredible and delicious menu choice. Peter the day cook and Jo the night cook are rated tops, and personally I have never been so spoiled in my life. My day is filled with discussing research issues with David and John, learning as much as possible about the technology we are using, relaxing with a good book and having many chats with the crew. There is a great laundry on board and even a gym, but so far I have only done a bit of weights. I continue to write up my daily diary for the Finding Sydney Foundation and usually hit the sack about 10pm. I am sharing a cabin with Kelly from the Williamson & Associates team and she is on the night shift. I sleep like a baby in my darkened bunk being rocked by the waves. It was with high hopes that our SM30 was redeployed late last night as we commenced our next south-north run through the search box. Unfortunately the gremlins of the previous few days continued to affect the sonar equipment which again had to be retrieved during the forenoon so that fault finding could take place. As an observer on this expedition I can sense the frustration of all concerned as they work long hours in difficult conditions to try and solve these vexing technical problems. When we sailed from Geraldton, most of us were strangers. Indeed many of the Geosounder’s small crew had never served with one another before and were just as unfamiliar with aspects of the ship as we were. Such is the way of the off-shore industry. What I have observed throughout the trials and tribulations of the last week, however, is the welding of our small band of men and women into a functional ship’s company who remain committed to pressing on with the task in hand in spite of these unbelievable set-backs. As work continues on the SM30, and with the SM60 still available as a backup, I remain confident in the team’s ability to get back into the water soon and continue the search. Historical Anecdote: There have been four ships named HMAS Sydney which have served in the Royal Australian Navy. All four of these vessels served with distinction and the Battle Honours collectively won by them are displayed on an ornately carved wooden shield known as a Battle Honour board. This board is normally displayed in the vicinity of a ship’s gangway when in harbour as a public reminder of the deeds of all ships which have borne her name. Above Photograph - The Battle Honour board on HMAS Sydney IV. 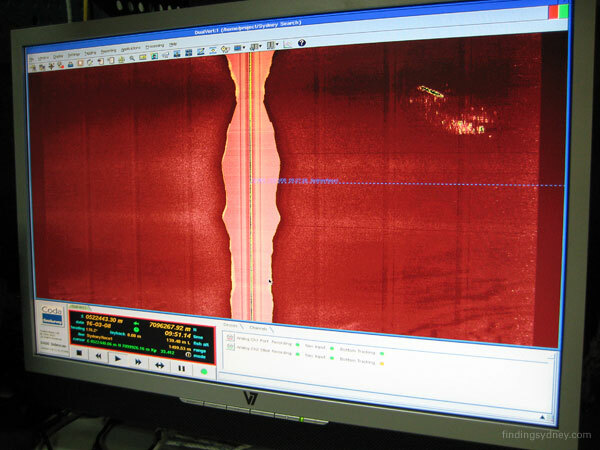 Shipwreck search projects generally fall into a rythym of running the side-scan sonar down a trackline followed by a turn to the next search trackline, repeated many times over. So a good rythym would be line, turn, line, turn, line, turn, etc. Unfortunately, our rythym has been line, recover for repairs, partial line, recover for bad weather, wait on weather, line, recover for repairs. Whilst it is frustrating to have had such an unlucky start to the search for HMAS Sydney, I also know that we are due better weather than we have had and that the problems with the SM30 sonar towfish are slowly but surely being sorted out. 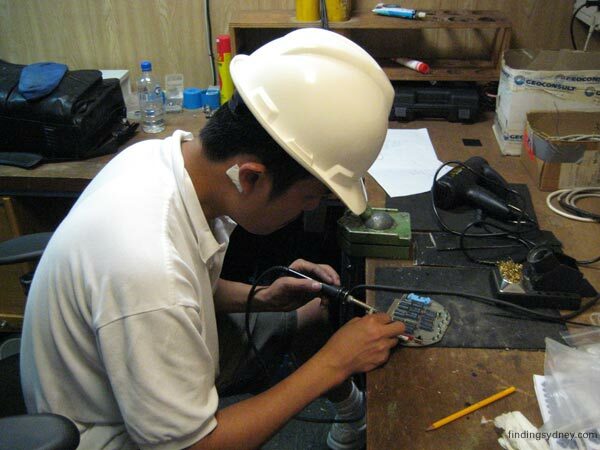 The Williamson & Associates technicians are fully committed and working very hard to deliver the best quality sonar imagery. Our project schedule does include a contingency for time lost due to such problems although I would have rather not used up this contingency so early in the project. It reminds me that we had a similar situation during the Hood & Bismark project in 2001 when we lost the first three days to a Force 10 storm in the Bay of Biscay. Knowing how that project ultimately turned out (we found and filmed both wrecks well within our alloted schedule) gives me confidence we could repeat that performance here off the WA coast. The following sequence of photos shows the recovery of the SM30 towfish. Above Photograph - Hauling the SM30 sonar towfish back towards the vessel. Above Photograph - Using a boat hook to grab a tag-line to steady the SM30 sonar towfish. Above Photograph - SM30 sonar towfish breaks the water. Above Photograph - Craning the SM30 sonar towfish inboard. Today’s dawn brought with it the end of our north-south run during which we had seen a slight deterioration in our SM30 sonar signal. 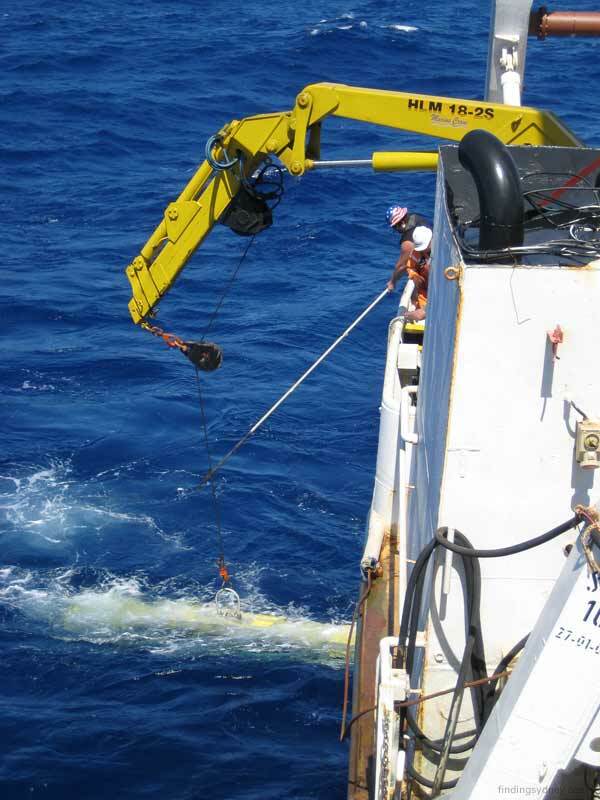 After some discussion it was determined to recover the tow-fish and replace the connection on the umbilical cord through which data is transferred back to the survey room. With blue skies above us and in reasonable seas, the fish was successfully recovered during the forenoon and throughout the afternoon the Williamson technicians set about rectifying the faults. The sonar was not the only ‘fish’ recovered. During the last few days of rough weather several flying fish had inadvertently made unscheduled landings on the Geosounder’s quarter-deck during their brief ascent from the sea. Needless to say, they were returned to whence they came. The intention is now to redeploy the SM30 tow-fish later this evening with a view to commencing our next search run as soon as possible. Although this is another break in our schedule, it has provided a good opportunity to review our research work and conclusions as well as those of other independent researchers who, although not directly involved in this project, have done much to keep the interest in the story of Sydney alive. With Ophelia out of the way we were able to resume the search today and start to make a dent in the search box. However you compare it, our search box is extremely large. In marine terms it measures roughly 1,800 square nautical miles (a nautical mile is 15% longer than a statute mile), or about 2.5 times larger than the ACT. It is by far the largest area I have ever set out to cover in a shipwreck search project. Another way to think about this search is to place yourself in a location on land, and imagine a box that extends 39 kilometres in every direction (i.e. to the north, south, east and west). The land will have areas that are flat and sandy, but also areas that are rocky and hilly. Within that enormous area the lost object to be found can be the size of HMAS Sydney (171.4 metres long and 17.3 metres wide), but in the case of Kormoran it is probably broken into a number of smaller pieces scattered about. Finally, imagine the land you are searching is flooded with several thousands of metres of water and this will give you an idea of the challenge we face. It was very good to be back on the hunt. John Perryman and I have set up our workspace in a room immediately adjacent to the survey lab. Here we can monitor the incoming SM30 sonar imagery on our own computer and be in direct contact with the Williamson & Associates sonar operators and the ship's bridge by telephone. Our space also doubles as a library for research documents and includes a chart table for navigational plotting. 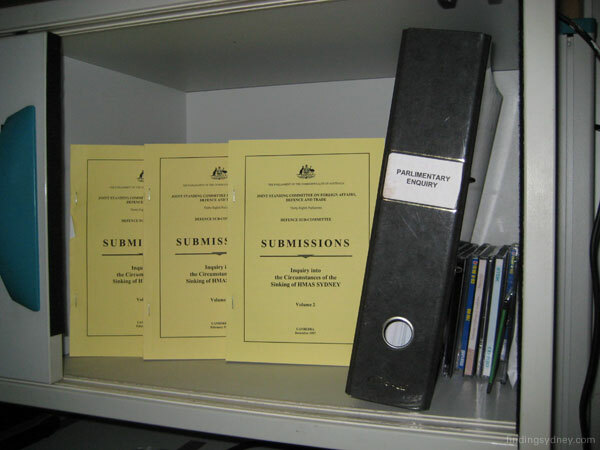 Above Photograph - A shelf containing the 1998 Parliamentary Enquiry Volumes on the sinking of HMAS Sydney. With the weather having improved considerably throughout the day we are now back in our search box, with our sonar deployed and our spirits rising following the challenges of the last few days. News of the discovery of another World War II shipwreck by the Norwegian mine-hunter HNOMS Tyr, was also seen as a very good omen. Tyr was taking part in a multi-national training exercise when she discovered the wreck of the Royal Navy destroyer HMS Hunter in 1000 feet of water. Hunter was sunk by German naval forces during the Narvik campaign of 1940. Of her crew of 145, 110 lost their lives. As if to reinforce the purpose of our own search, one of Hunter’s survivors, Fred Ward, spoke of his great sense of relief at knowing the final resting place of so many of his comrades. With this in mind the search team continues to monitor the numerous displays and monitors in the survey room for the first indications of a debris field that will lead us to Kormoran and Sydney. There is only one photo to go with our blogs today because there is only one subject that has dominated our day. The weather. Despite the fact that she was downgraded early in the day, Ophelia has continued to shadow the Geosounder and prevent us from recommencing the search. 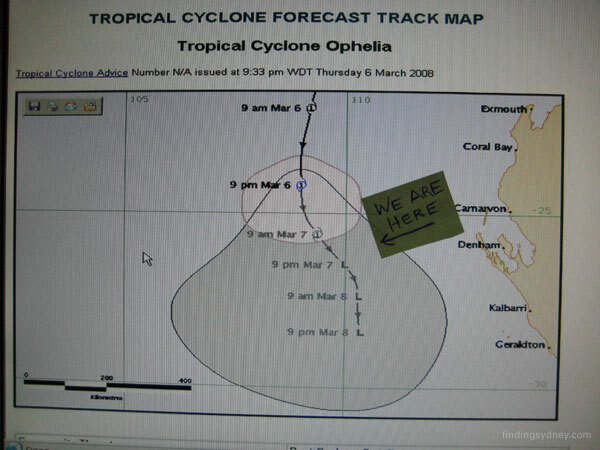 After Geosounder's third successive course change to avoid the dangerous southern quadrants of the storm, whereupon Ophelia also changed course to cover our tracks, I joked with the Master, Blair Cliffe, that Ophelia well and truly had his number. It appeared that Blair had finally out foxed Ophelia in his last turn to the West back towards the search box because the wind suddenly dropped from 28 knots to about 10 knots and the sea began to lie down. Unfortunately Ophelia had one last sting in her tail because two hours later we were being buffeted by 38 knot winds with gusts to 45 knots. At times it felt like we were playing one big game of chess with Ophelia. On our side we had a lot of help from the Bureau of Meteorology (Bruce Buckley and Brad Centos) and the RAN Duty Forecaster who supplied up to date forecast information throughout the day. The sea is still too rough to allow a safe launch of the SM30 sonar but everyone is standing by and anxious to get it back in the water as soon as Ophelia lets us. Throughout history, seafarers have had to consistently use their ingenuity to improvise, adapt and overcome in the face of adversity. The very nature of ships is such that when they sail and the 'umbilical cord' connecting them to shore infrastructure is cut, they become dependant upon their own provisions and resources. Notwithstanding the technological advantages enjoyed today by mariners the world over, this truism remains. Today I was reminded of this opening paragraph as I observed the Williamson technicians working tirelessly to restore their SM30 towed array to full operational condition. In a vessel being continually tossed around by a heavy swell, and without the luxury of stable and fully equipped shore based workshops, they were certainly up against it. Remarkably the faults were traced one by one and rectified and I was pleased to see that the old adage – improvise, adapt and overcome still rings true. To quote the famous author Nicholas Monsarrat, the ‘cruel sea’ now remains our only real obstacle before we can continue our search for Sydney and Kormoran. When I said yesterday that more twists and turns were to come I wasn't expecting them to come so fast. The first twist was a particularly cruel one. 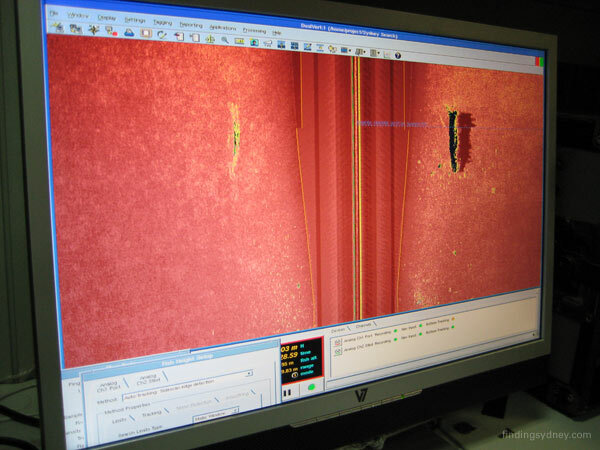 Towards the end of our first sonar trackline it was clear that the SM30 towfish was having some problems that affected the quality of the sonar imagery being produced and had to be recovered for repairs. One immediate problem was solved straight away when an electrical cable was found to be nicked allowing seawater to penetrate the cable and cause short circuiting. The offending cable was easily replaced. The remaining problems were far trickier to troubleshoot as they involved the delicate electronics of the SM30 towfish that are the domain of Carter Le, the electronics engineer who is a key member of the Williamson & Associates sonar team. Carter worked many hours throughout the day finding and fixing two faults after which the only thing left to do was deploy the towfish again to see if the imagery was good enough to resume searching. Several hours later and with 6,000 metres of towcable deployed the turn we dreaded had just taken place. Tropical Cyclone Ophelia, a category 1 storm packing gale force winds decided to change course and turn directly for our location. Whilst it is hard to find a silver lining as a cylcone bears down on you I am grateful that Ophelia is nothing like as severe as the Western Atlantic Hurricanes I am used to. Still we are facing certain weather downtime, which although expected and budgeted for, is hurtful to our progress at this early stage in the search. There is an old saying that the sea doesn't give up her secrets easily and it appears that Ophelia has dropped in to remind us of that. 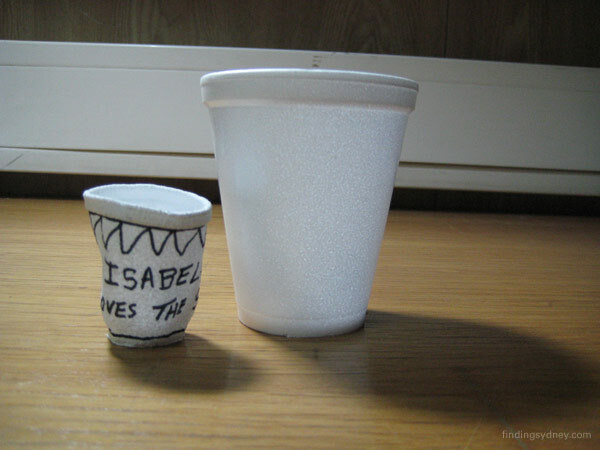 Above Photograph - two polystyrene cups, before and after being squeezed by several thousand metres of water pressure. Today I witnessed first hand just how much pressure is exerted on the side-scan sonar equipment when it is operating in very deep water. Prior to its launch before the first run, the Williamson crew placed a number of polystyrene cups, which they had written their names on, in a small bag attached to the sonar. When it was recovered, the cups were retrieved but had been compressed in size to about one third of their original size. Apparently this is due to the air being squeezed out of them by the intense water pressure. Many of the cups had been adorned with artwork and logos and they will no doubt become memorable souvenirs of this expedition. With some minor repairs required on the sonar, today was fairly quiet, however it is expected that it will soon be re-deployed as we commence another run through the search box. For more information concerning HMAS Sydney (II) visit: www.navy.gov.au/spc and visit the ship history pages. 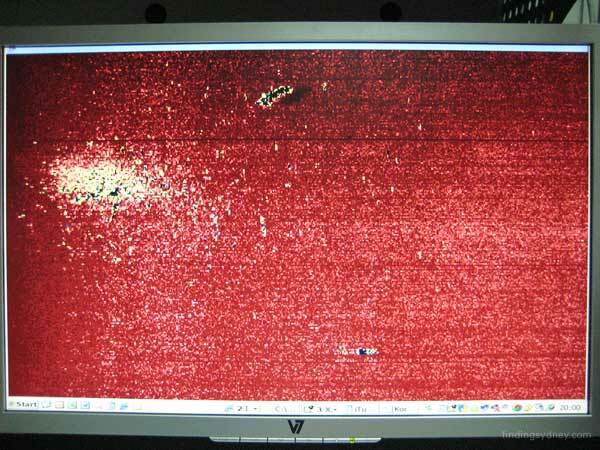 The most anxious time for any search is the first sonar trackline through the search area. This is when you learn whether the area you are searching consists of either rough geological terrain or a flat smooth seabed. You also learn for the first time whether the weather and sea conditions will allow you to tow the sonar in the direction and speed your desire without difficulty. Complications due to rough geology and/or uncooperative weather and sea conditions can make all the difference to whether a search ends successfully, or in failure. As our sonar was tracking through the initial section of our first trackline (actually Line # 07 as per our line-naming convention) I started to get very concerned that luck wasn't going to be on our side. The seabed geology wasn't that awful, but it certainly wasn't going to be easy to detect a shipwreck amongst all the geological formations that cluttered our screens. The Geosounder's watch officers were also finding it difficult maintaining the perfectly straight trackline we require at the slow speeds of 2.5 knots. The combination of the two difficulties, amongst a number of other technical issues, made the first few hours searching very uneasy. As the sea is ever changing, however, so was our fortunes and a couple of hours later the seabed started to get very flat and featureless (ideal terrain for shipwreck hunting) and the Geosounder began crabbing down the line at an angle that maintained good steerage as well as speed. It always takes some time to iron out the kinks and for a search to take on a pattern and rythm of efficiency and this is what first tracklines are for. We can only hope that our good fortune continues although experience tells me that there are many twists and turns to come. The following series of pictures show the main survey room on the Geosounder where the Williamson & Associates search team and DOF Subsea navigators work. 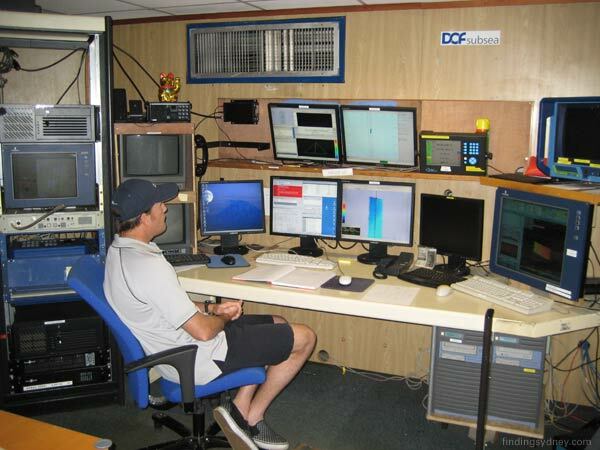 The above photograph shows the central control room where all the search sonar, survey and positioning equipment is operated from and data is logged. It comprises three main work stations which are shown in following photographs. Above photograph shows the navigator's station for operation of the Differential Global Positioning System and Mult-Beam Echo Sounder Systems. Above photograph shows the sonar operator's station where he "flies" the towfish altering its height above the seabed. 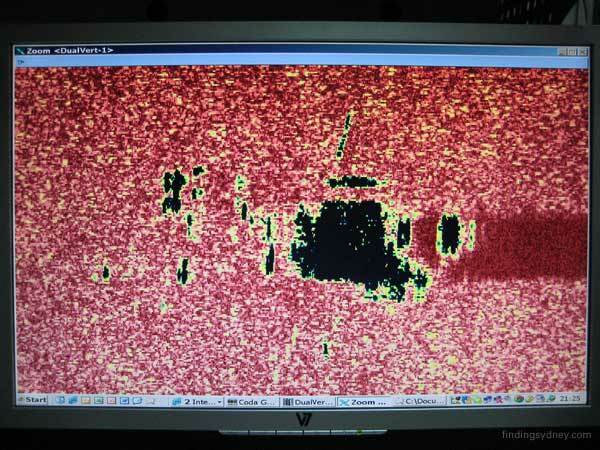 Above photograph shows the off-line station for post-processing of the side-scan sonar data. Today’s dawn followed a successful night of trials on the Williamson sonar equipment which had been successfully deployed during the previous night and recovered in the early hours of the morning. A visit to the bridge and a quick study of the chart revealed that we were now steering north-west towards our search box at around about 8 knots. We expect to arrive in the area where the epic battle between Sydney and Kormoran is believed to have taken place at around about midnight. As we enter these waters, one can’t help but try and imagine what it must have been like for the crews of both vessels on that fateful day in November 1941. I suspect that others on board have had similar thoughts as we get down to the business end of the search which will commence as soon as we reach our midnight position. Throughout the mobilization and during the voyage there have been many discussions amongst the team concerning the Sydney and Kormoran as our international friends have come to learn more about this tragic episode of Australia’s Naval history.